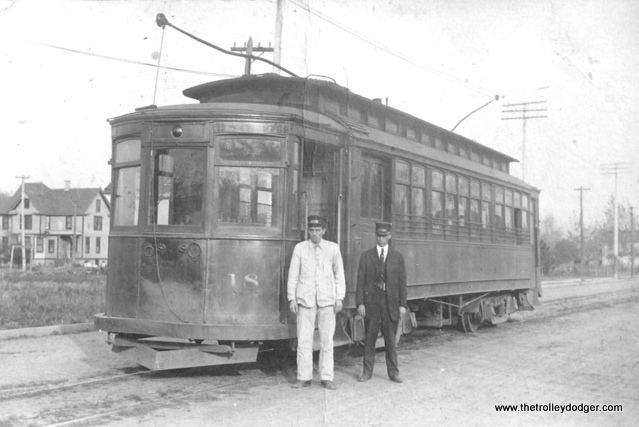 I’m attaching a photo of my grandfather, Arthur Defenbaugh from Streator, who was a conductor on the Streator to Ottawa branch, with his engineer, standing in front of their trolley. I don’t know when or where the picture was taken. 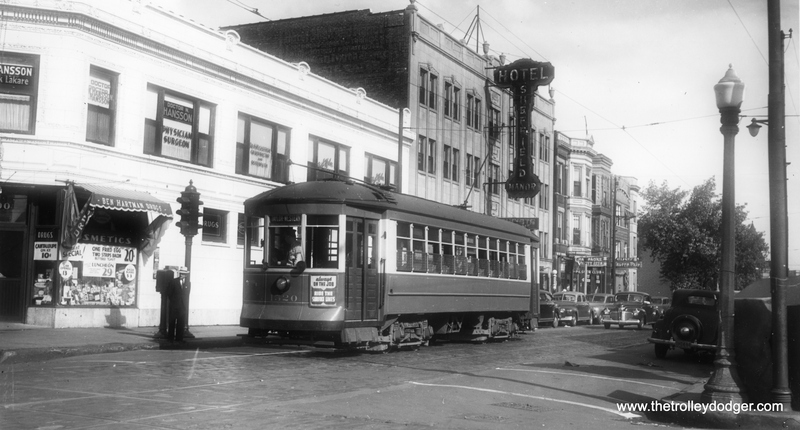 We think it was Streator. 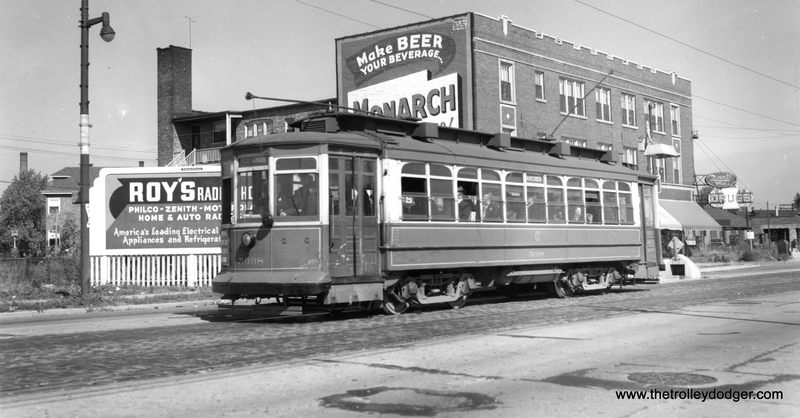 I believe it was in the late 20’s as this is a metal trolley car. 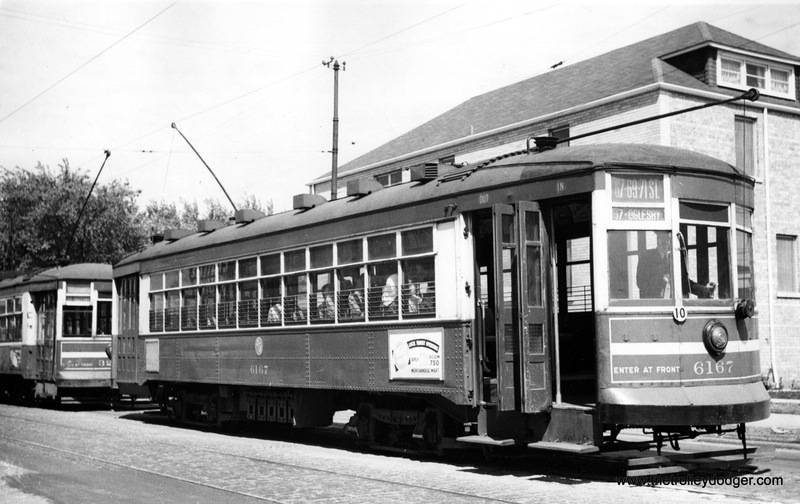 The trolley car number appears to be 18. 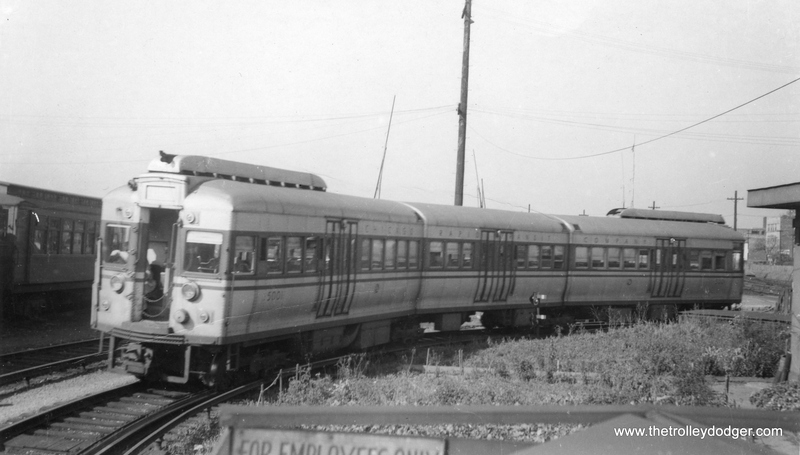 I read on your website that you don’t have many operational era photos for the CO&P. I thought you would enjoy it. If you have information about my grandfather or the other gentleman, please let me know. 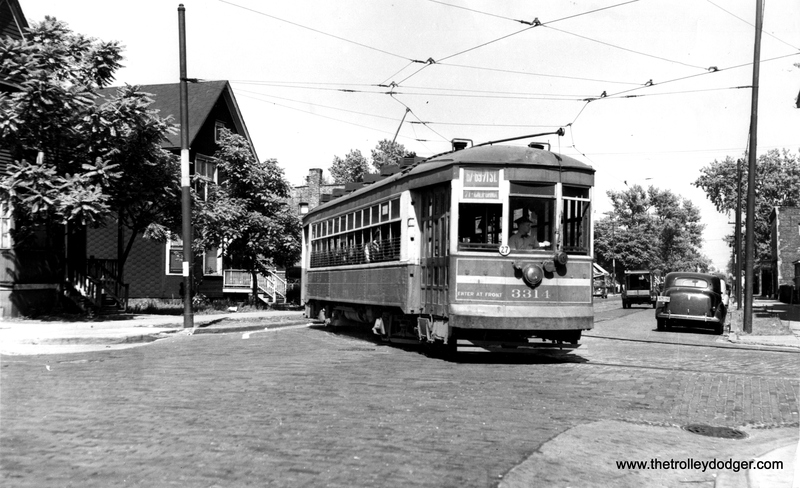 Arthur Ingram Defenbaugh was born on October 6, 1881, and died in July 1972, aged 90. It appears he spent most of his working life as a farmer. His wife died in 1926 and it does not appear he ever remarried. If any of our readers have additional information, please let us know, thanks. 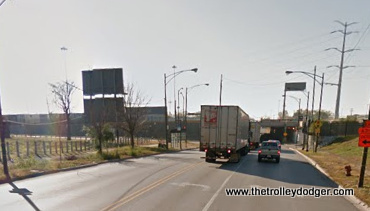 In this note I want to comment about photos of Indiana Ave. and Harvard Ave. in Chicago Rapid Transit Photos, Part Three (March 23, 2016). 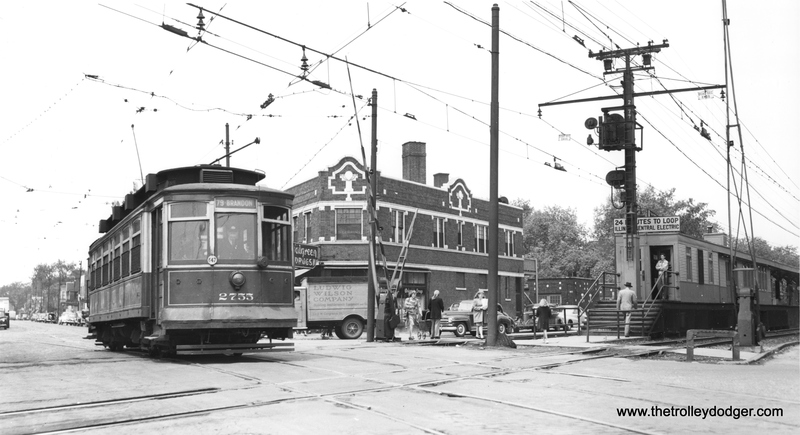 You show the South Side L Indiana Ave. station in two pictures. 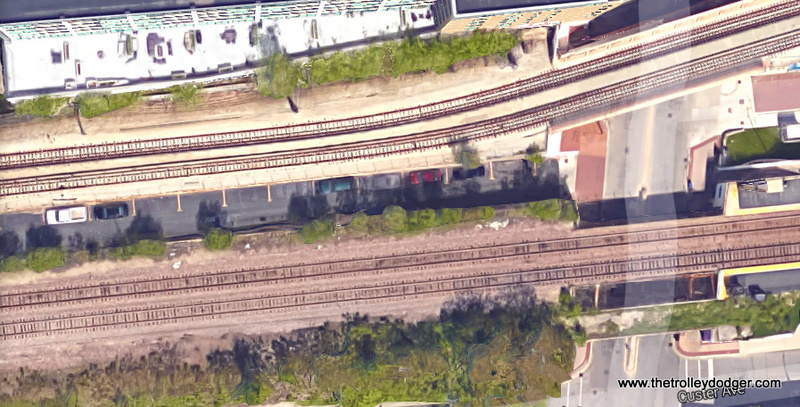 I saw Andre Kristopans’ comment at the bottom, and I learned something from his comment: I had no idea the middle track west of the station was used for storing spare Stock Yards L cars. But I am sure Andre is correct. The first photo shows a bigger scope. Let me start with the platform at the right. 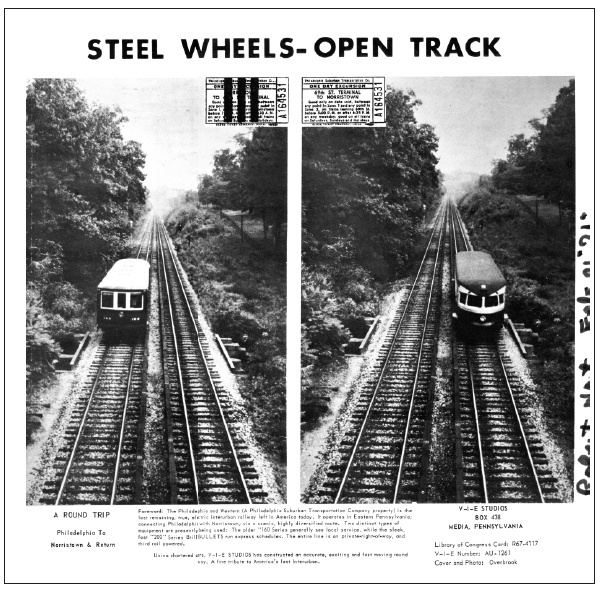 Notice that the section of wood nearest the track looks newer than the wood under the cover. 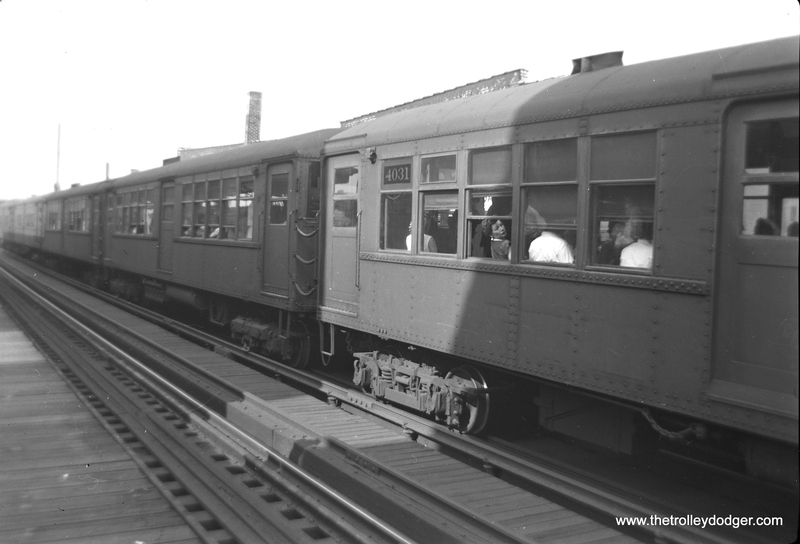 This is because the newer wood was constructed over the third track that went through the station. 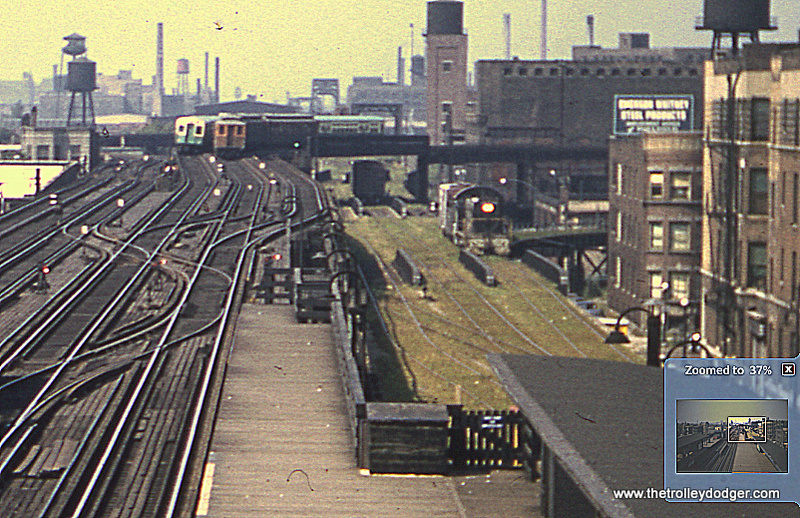 Yes, there were three tracks on the north / south main. 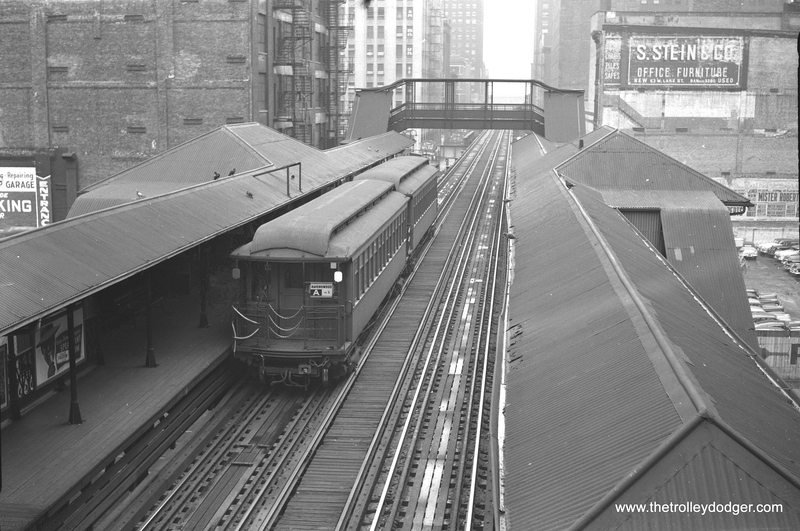 The three tracks actually continued east of the station, then south on the north / south main to just north of the 43rd St. station, where the easternmost track merged into the middle track. 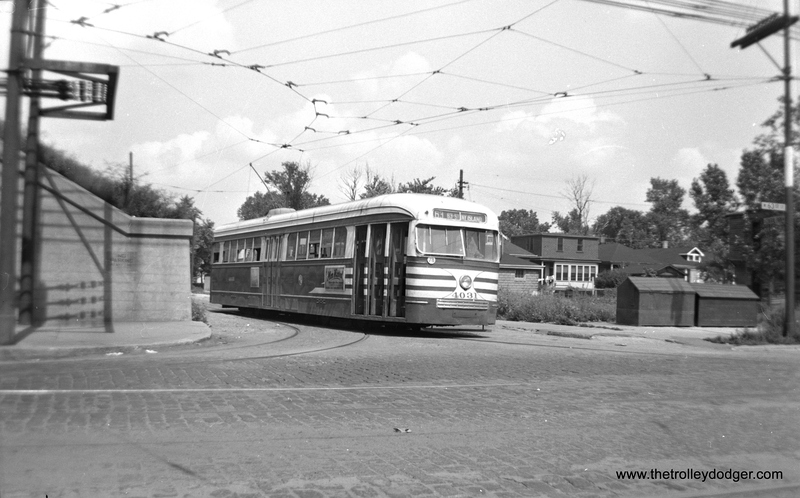 Also, prior to (I think) 1949, the Kenwood L did not end at Indiana Ave. 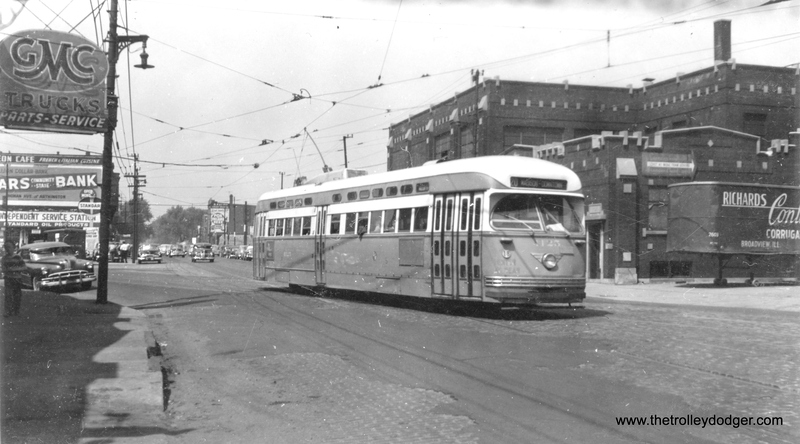 Instead, it went downtown onto the Loop. 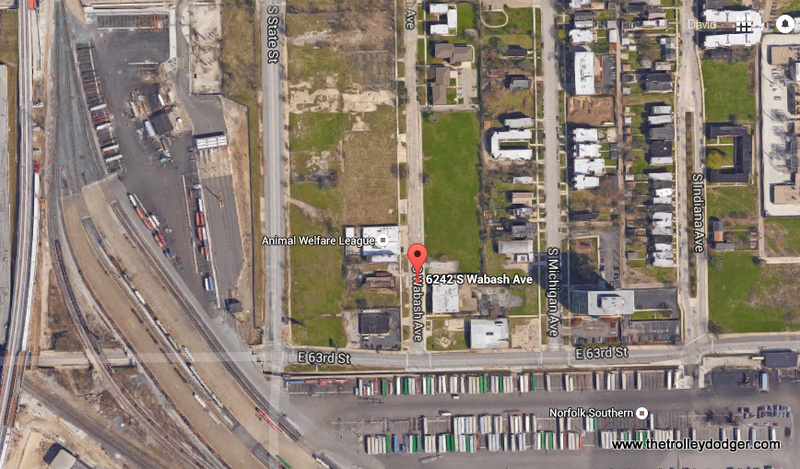 I’m not sure where it went from the Loop — some sources say to Ravenswood, others say to Wilson. 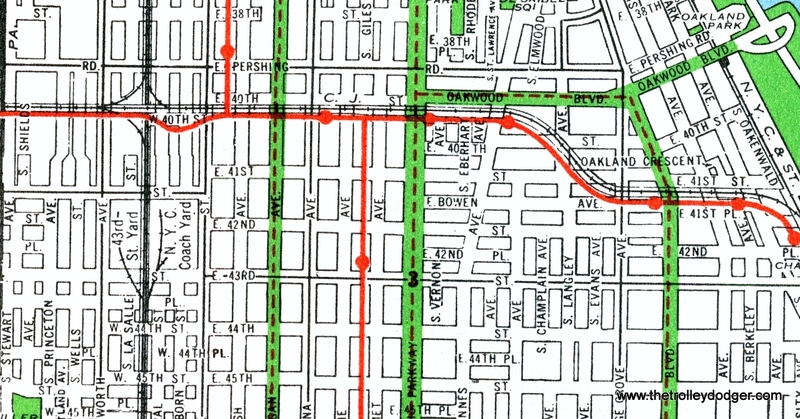 My own experience is that the Englewood ran to Ravenswood, and the Jackson Park ran to Howard, through the State St. subway. And I think the Kenwood ran to Wilson. 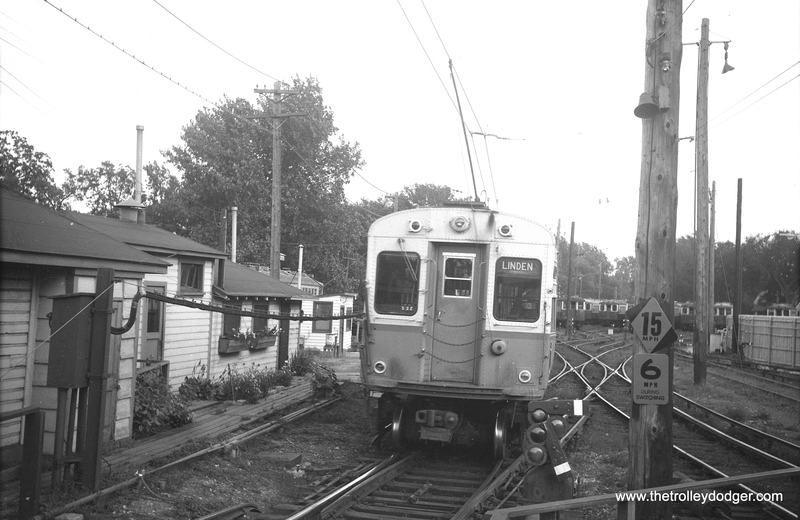 There were several smaller stations north of Indiana that were serviced by the Kenwood L. The Englewood and Jackson Park were supposed to be express through that area but were frequently delayed by being behind Kenwood trains. 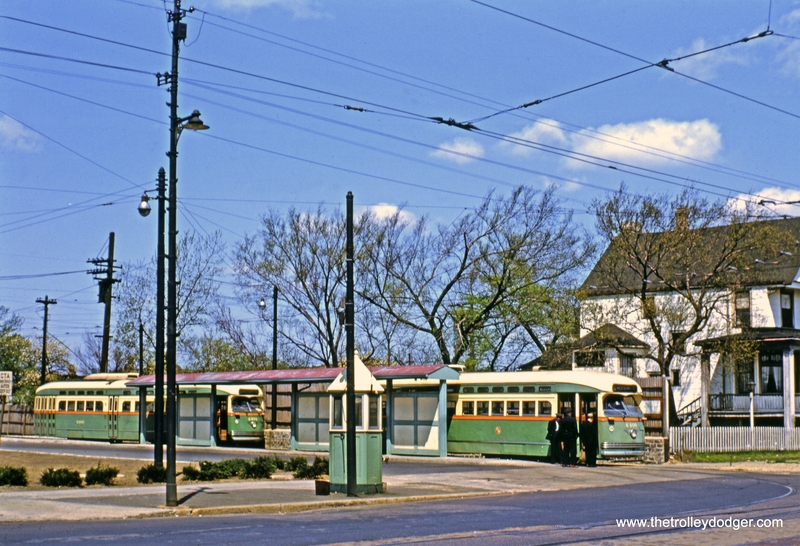 Back at the Indiana station, both the Kenwood trains and the Englewood / Jackson Park trains used the two outer tracks of the three-track main. South/east-bound Kenwood trains crossed over from the southernmost main track to the Kenwood L structure to head east. 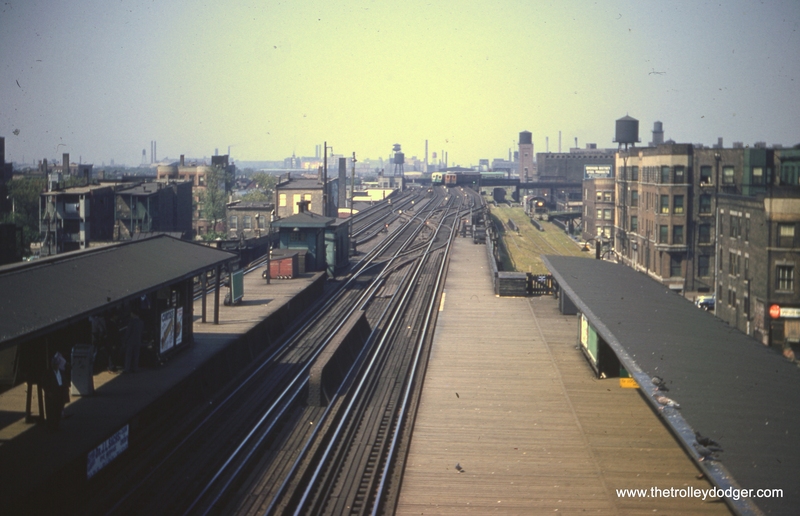 Later, when the Kenwood was cut back to shuttle service from Indiana to 42nd Place, the wood was added to cover most of the north/westernmost outer main track, leaving (at the east end of the platform) the terminal for the Kenwood shuttle. 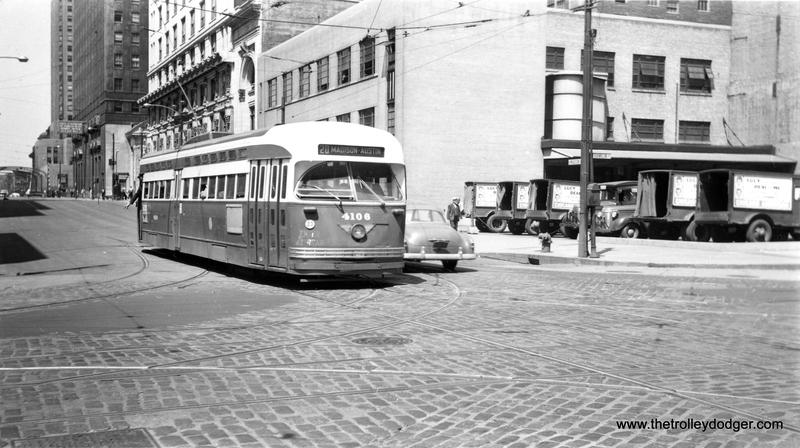 As I recall, that space could accommodate two cars. 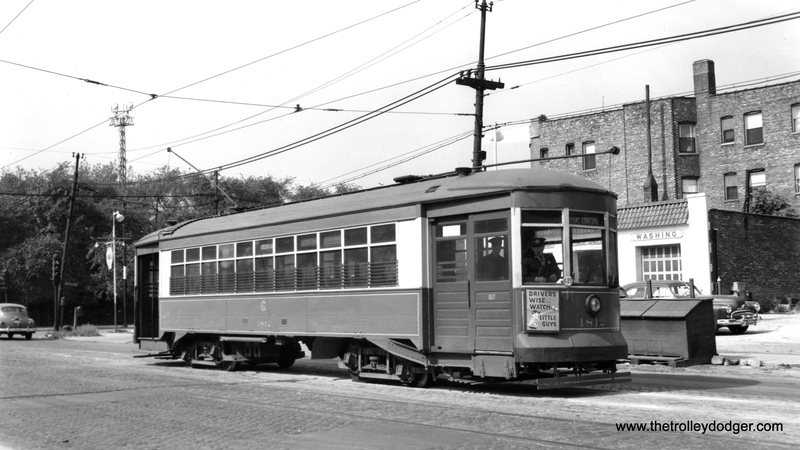 When Kenwood cars needed service, they turned south onto the easternmost main track, merged into the northbound main near 43rd St., switched over to the southbound main, and made their way to the Jackson Park yards at 61st St. and lower 63rd St. 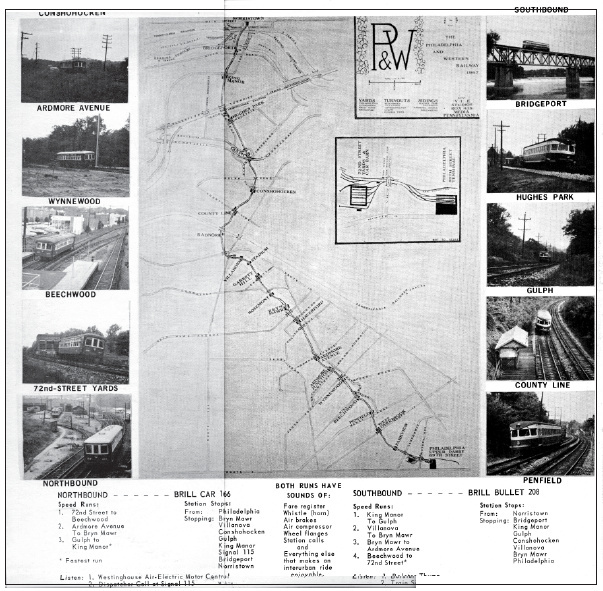 So the photo shows two main tracks through the station, which had been the middle and south/westernmost tracks of the three-track setup. 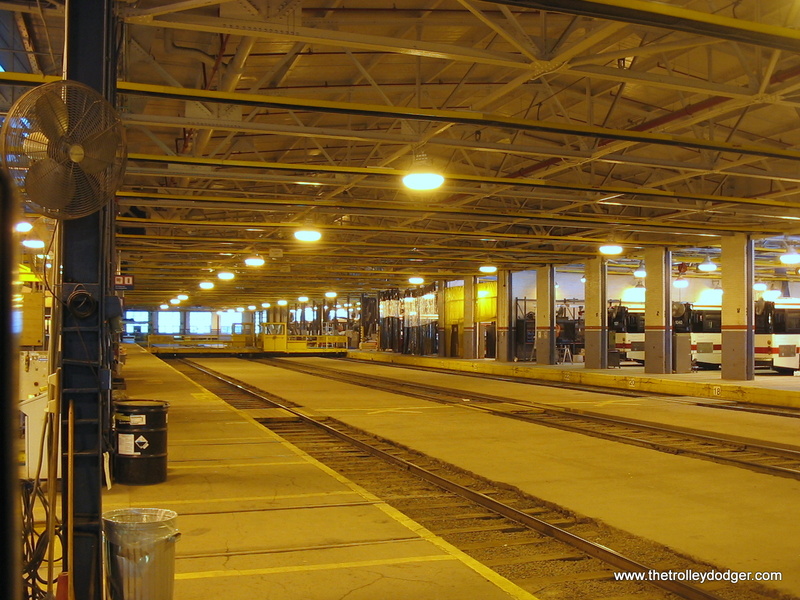 Regarding the platform at the left, you see that the Stock Yards L terminated on the south side of that platform. 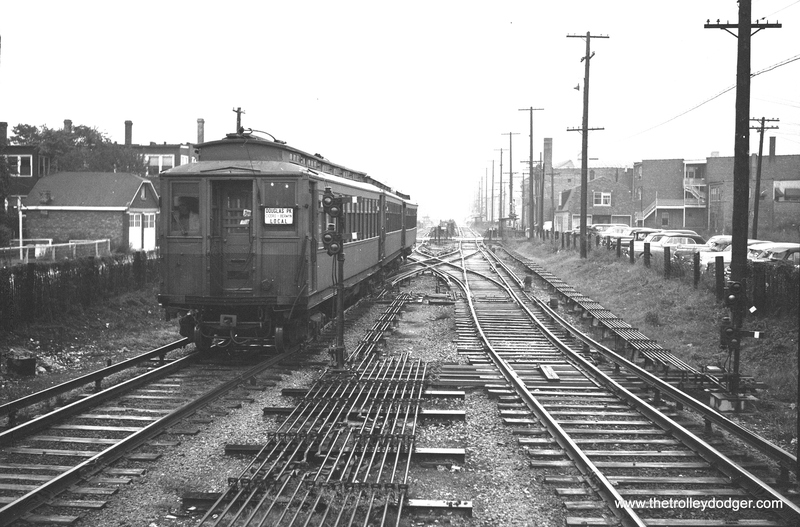 Its only connection to the rest of the L system was the set of switches west of the Indiana station. 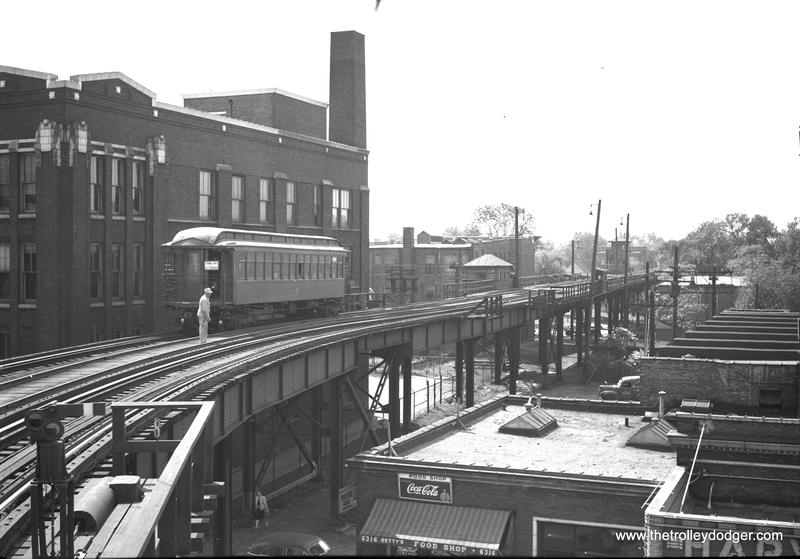 The Indiana station had an overhead bridge connecting the two platforms, thus enabling north/west-bound customers to access the Stock Yards L, and south/east-bound customers to access the Kenwood shuttle. 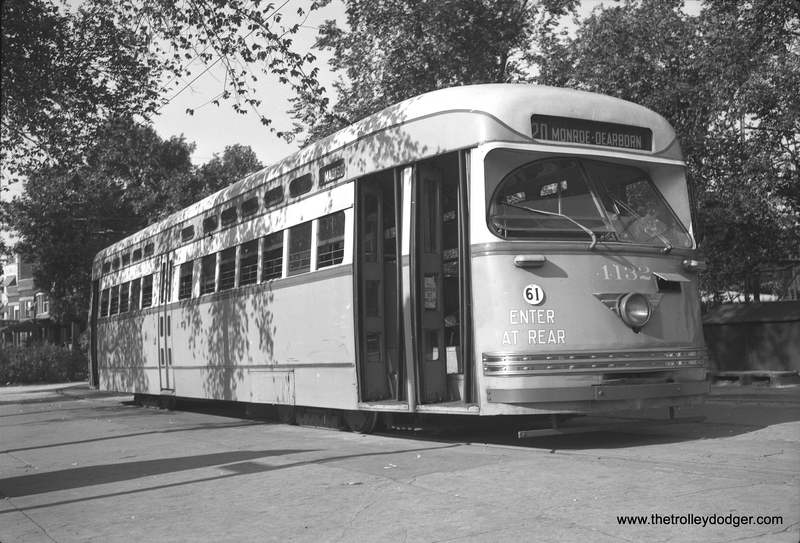 Now, on to the picture showing the Normal Park L shuttle. 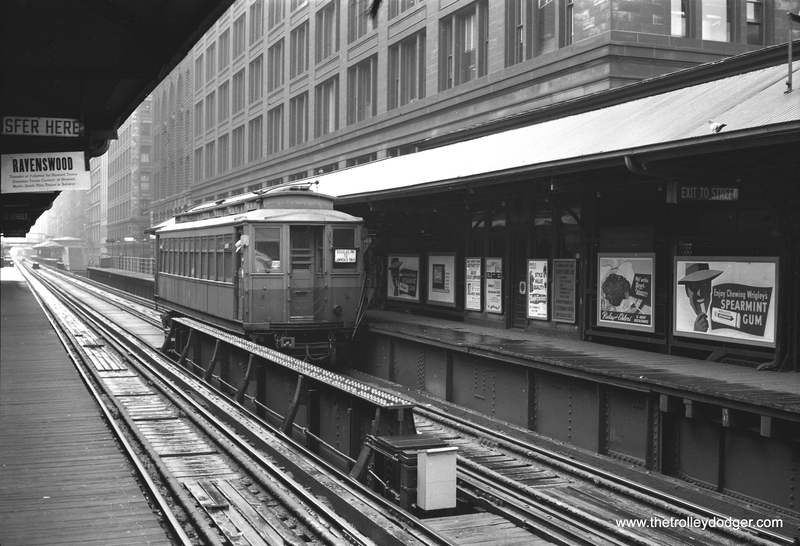 I think it was in 1949 that the CTA relegated the Normal Park line to shuttle service. 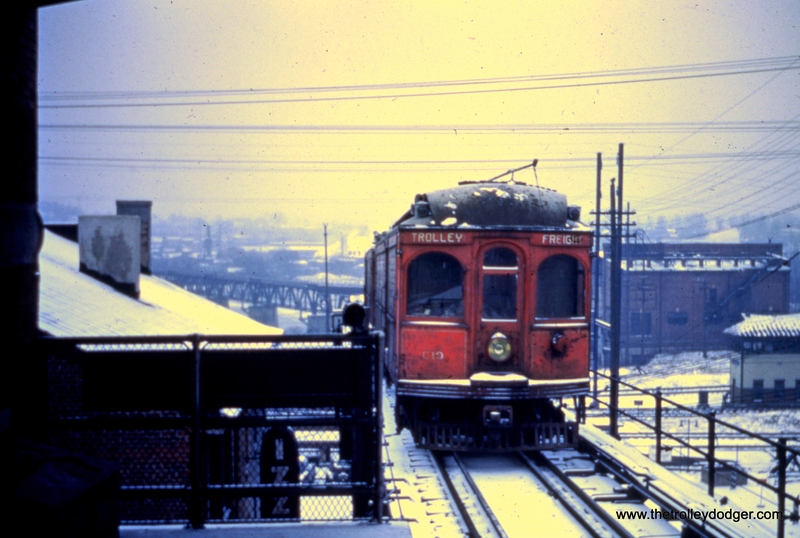 Before that, the Normal Park cars were hitched onto the rear of Englewood trains. So people riding the Englewood L southbound had to be alert that the last car would be split off and go to 69th and Normal. If someone was in the wrong car, he/she could move between cars, which is apparently taboo today. 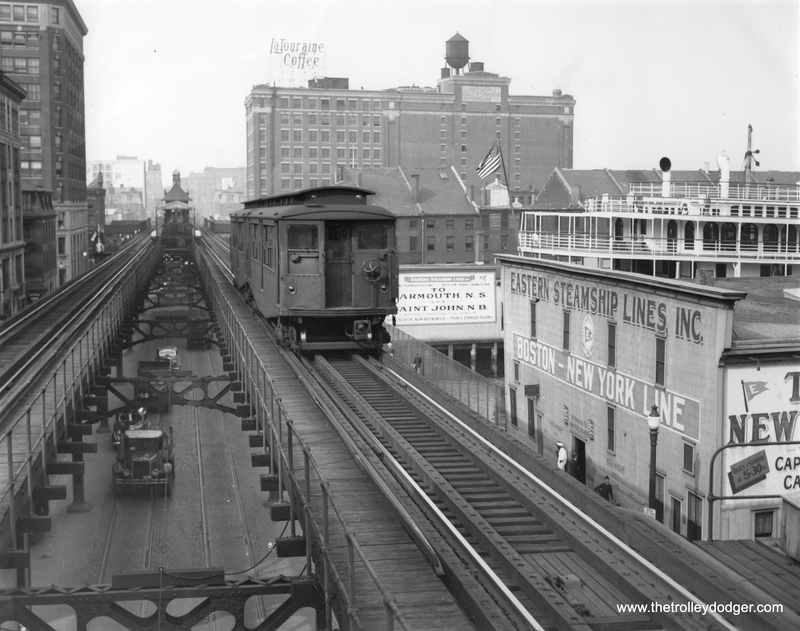 The structures along the sides of the L track are where the connections were made and unmade. Workers were stationed there to do this. Yes, even in frigid weather. 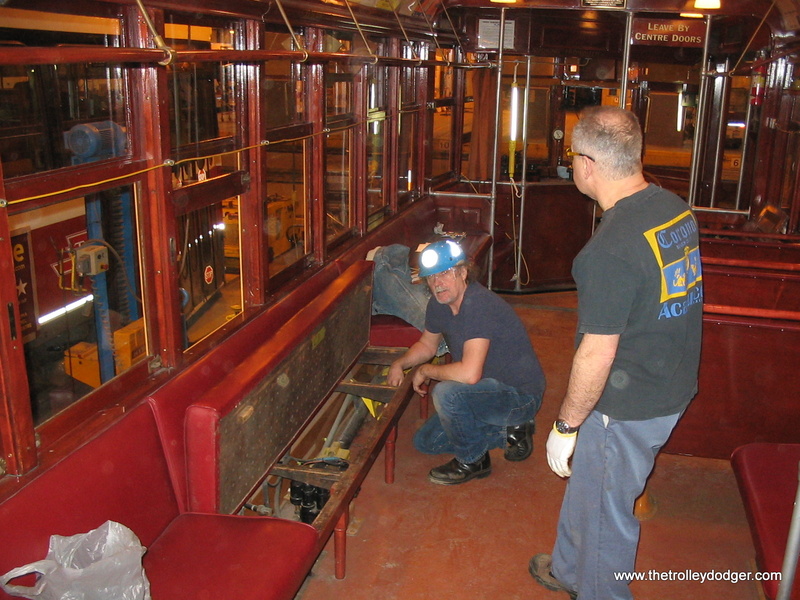 And with live third rails. OSHA would have had a fit. 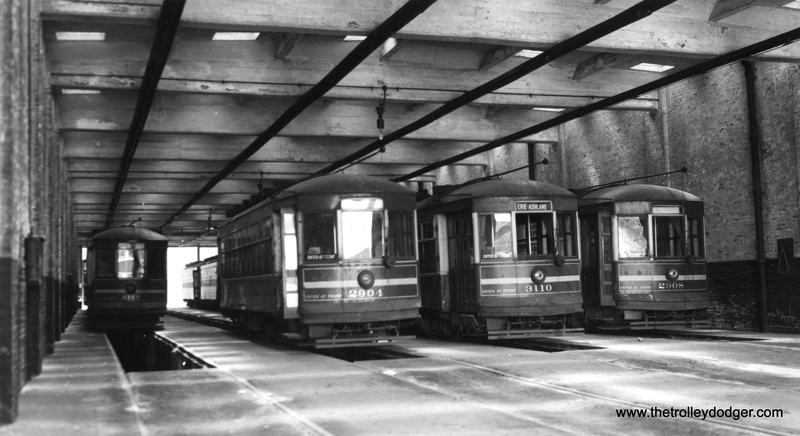 The motormen of northbound Normal Park trains rode the trains into the Harvard station, then down and under to the southbound platform, then onto the last car of incoming southbound trains. 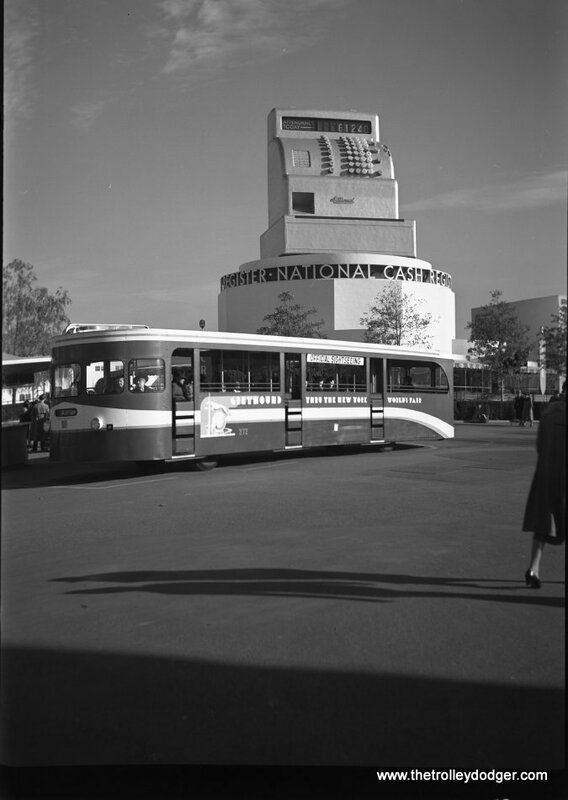 You also see in the distance the switch tower where the Normal Park line branched off to the south. 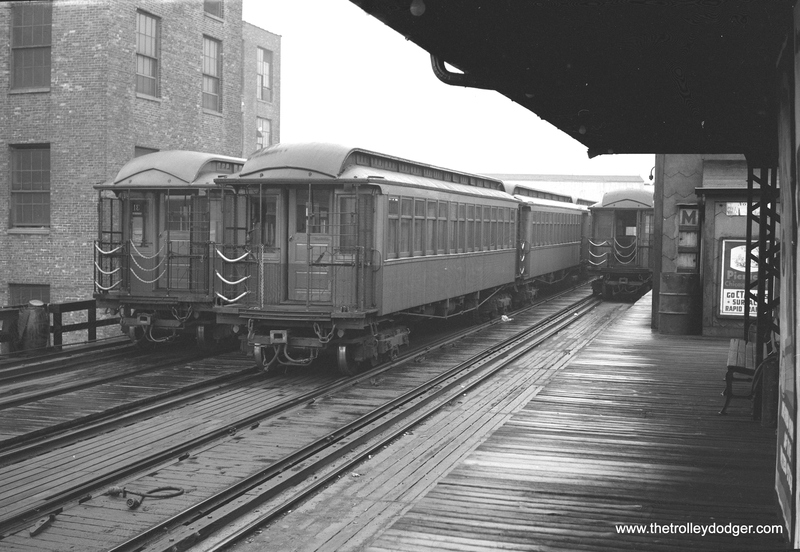 When the Normal Park line became shuttle service, northbound trains went into the Harvard station. 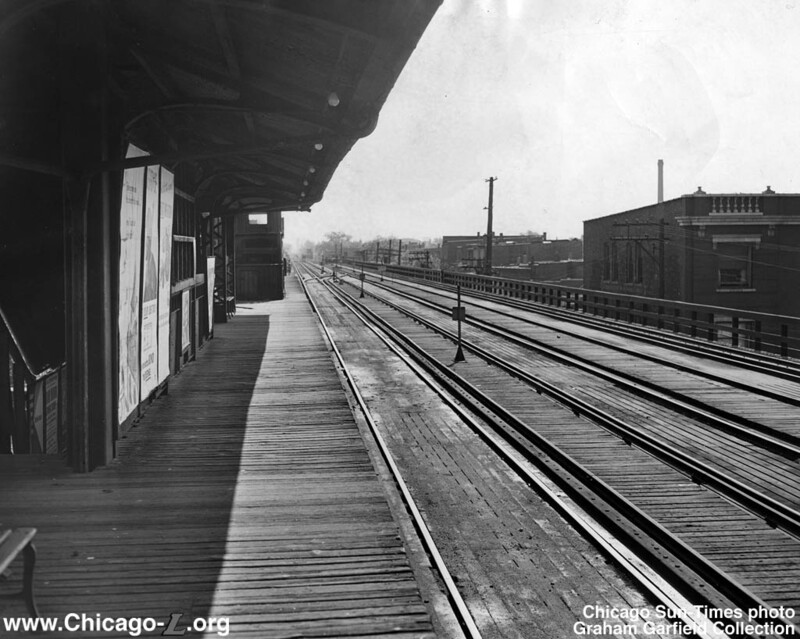 The motorman quickly changed ends, then immediately (so as not to delay northbound Englewood trains) proceeded to the switch over to the south/west-bound track. You can see this switch next to the bigger structure. 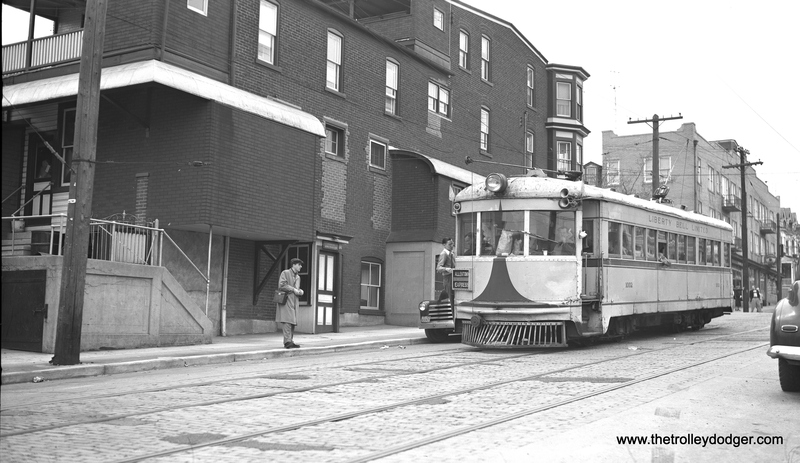 In the photo, I have no idea why the motorman of the Normal Park car is standing in the walkway between the tracks. Perhaps this picture was deliberately posed. 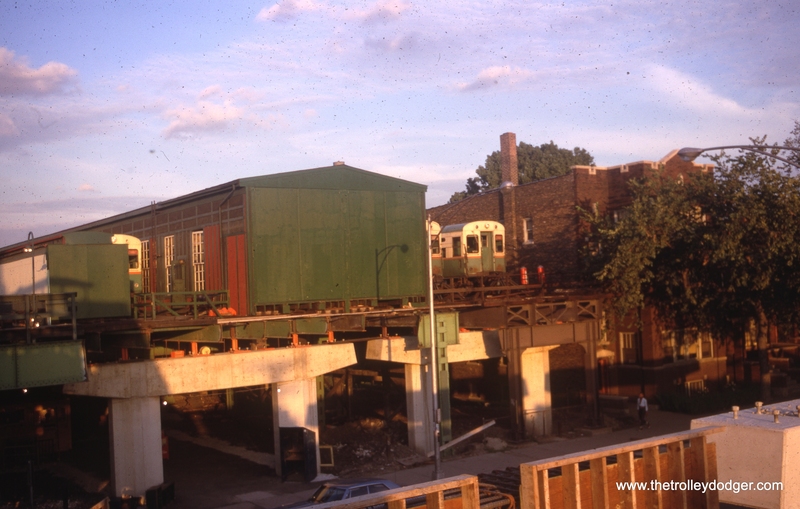 This photo was taken from the southwest end of the south/west-bound L platform at Harvard. 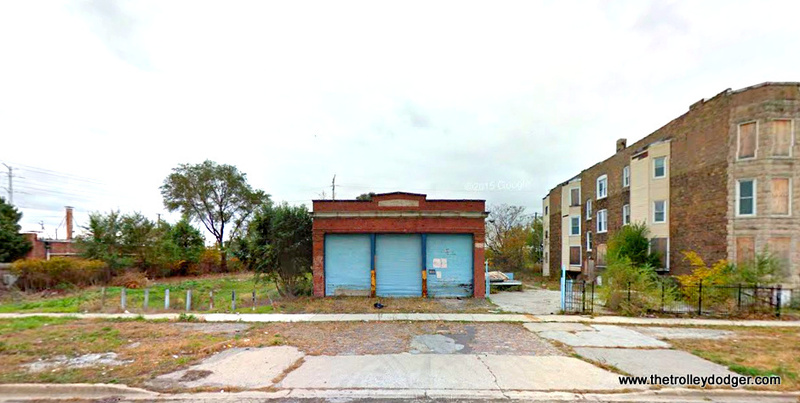 The address on the food shop below is 6316 S. Harvard. 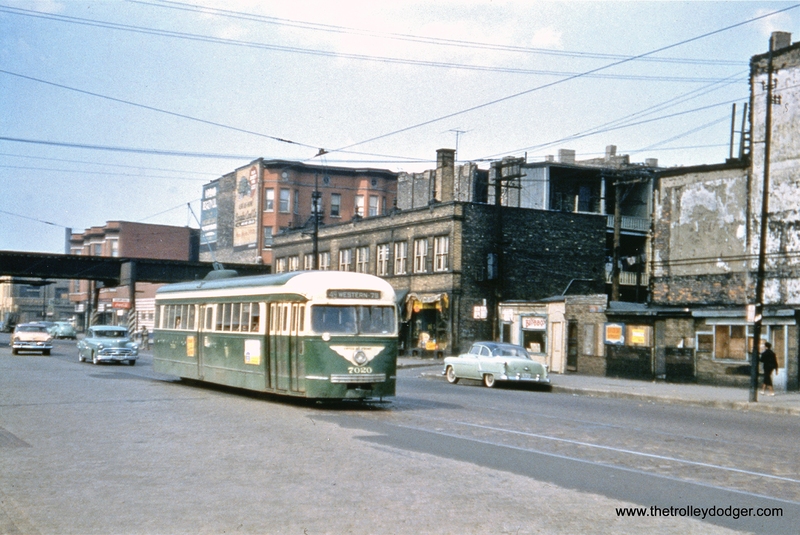 Busy 63rd St. was just to the right, and a block south at 64th St. and Harvard Ave. was St. Bernard’s Hospital, which I believe is still there. 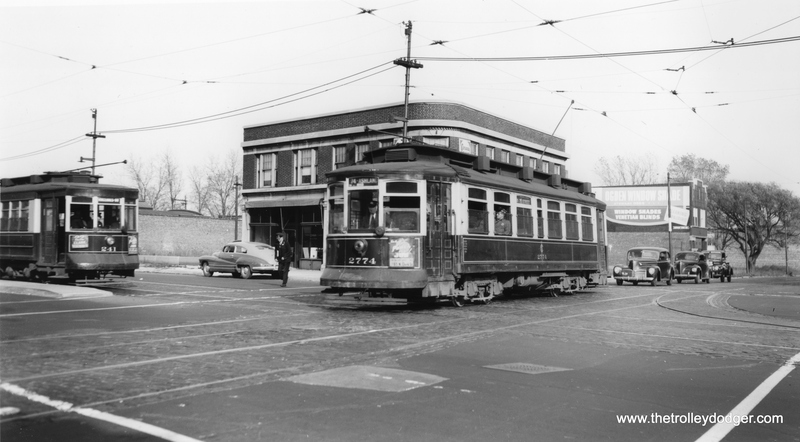 Two blocks east of the Harvard L station was Englewood Union Station (New York Central, Nickel Plate, Pennsylvania, Rock Island), and three blocks west was the other Englewood train station (Erie, Monon, Wabash, Chicago and Eastern Illinois, Chicago and Western Indiana). 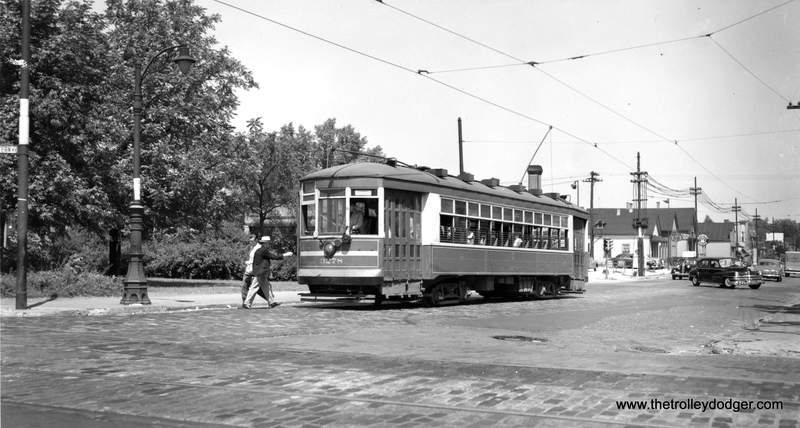 Plus, there were several streetcar lines. 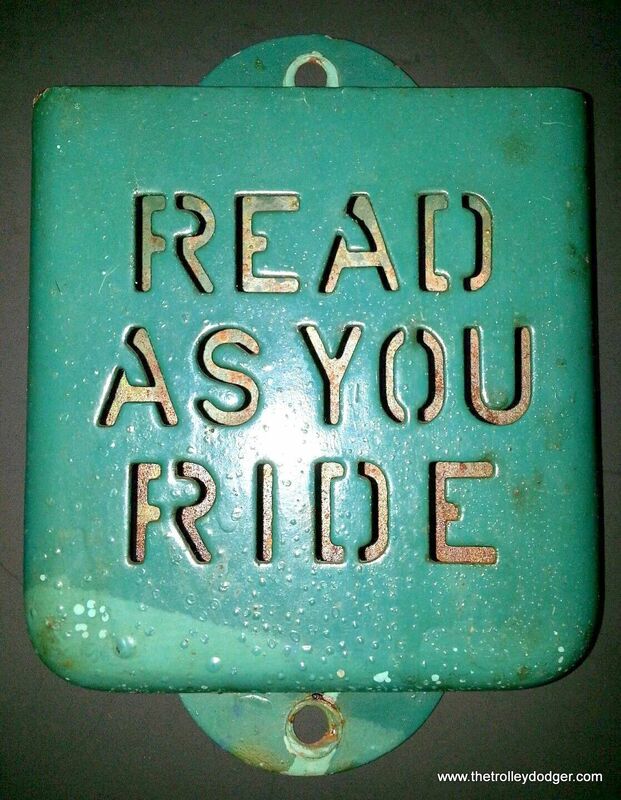 All told, for a fan of anything on rails, it was nirvana. 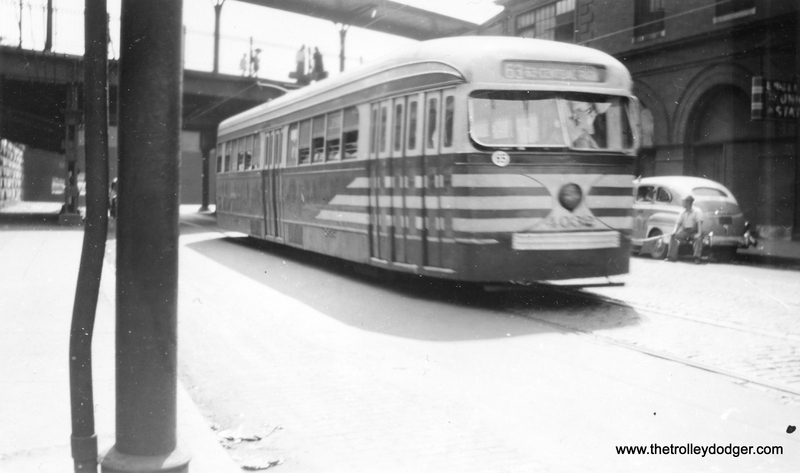 There’s a photo negative on eBay that is identified as showing a couple streetcars at the 1933-34 Chicago World’s Fair. Yet I don’t recognize where this could have been taken there. 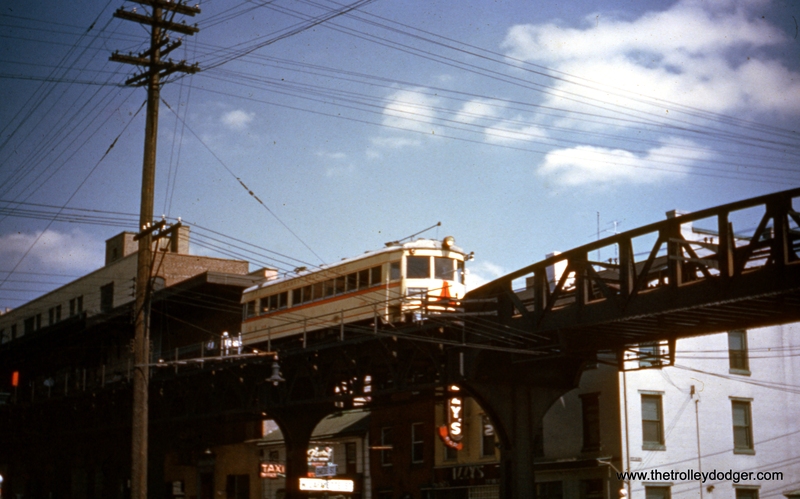 I know that Chicago Surface Lines had a couple of line extensions built to bring people to the fair, but was not aware of any trolleys on the grounds themselves. 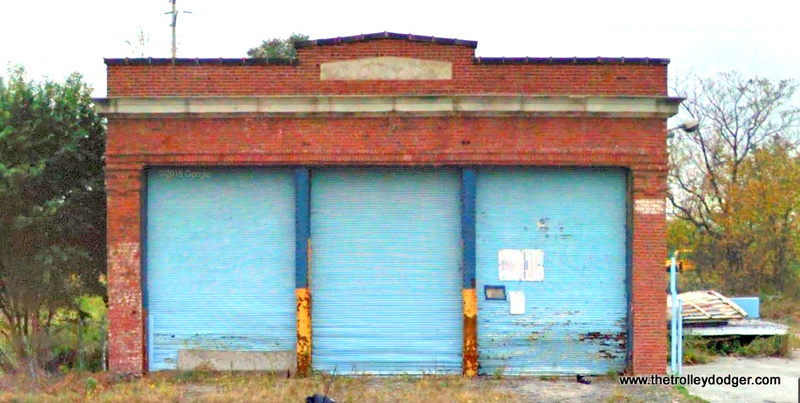 Is the photo misidentified, and if so, what does it actually show? To me, it looks like it could have been taken in Europe. 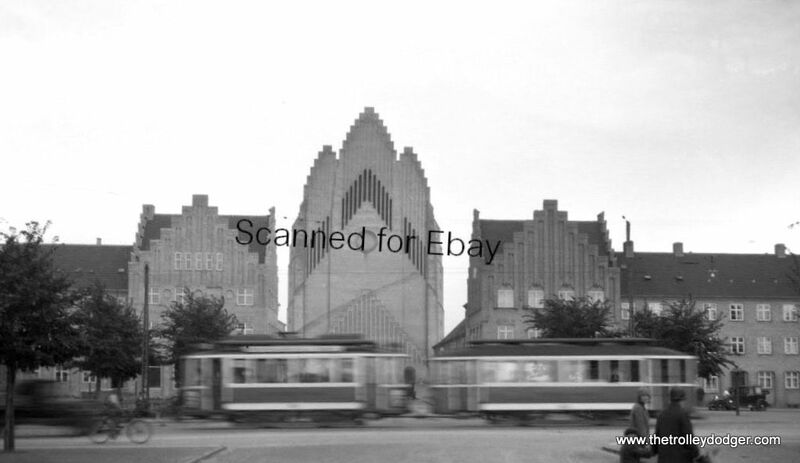 The famous Copenhagen church (Grundtvigskirke) just behind the trams might be a good clue. 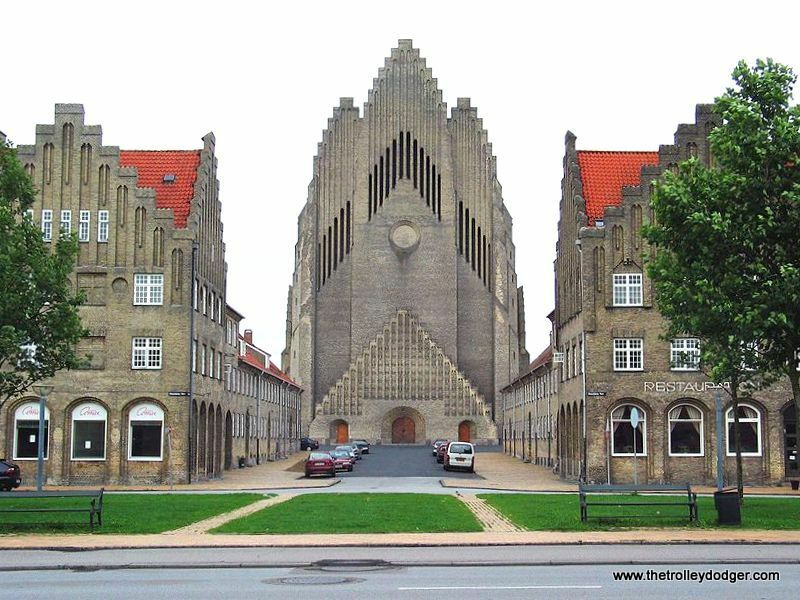 Pardon my stupidity, but I assume you mean the famous Copenhagen church in Copenhagen, and not one that was moved, brick by brick, to the 1933-34 Chicago World’s Fair? 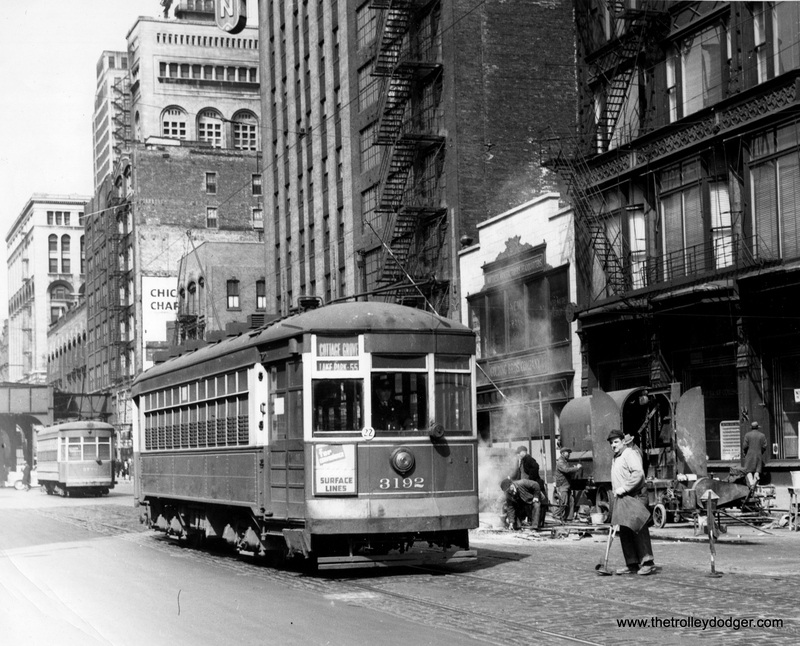 I wonder what it was about this picture that made the seller guess that it was taken in Chicago. 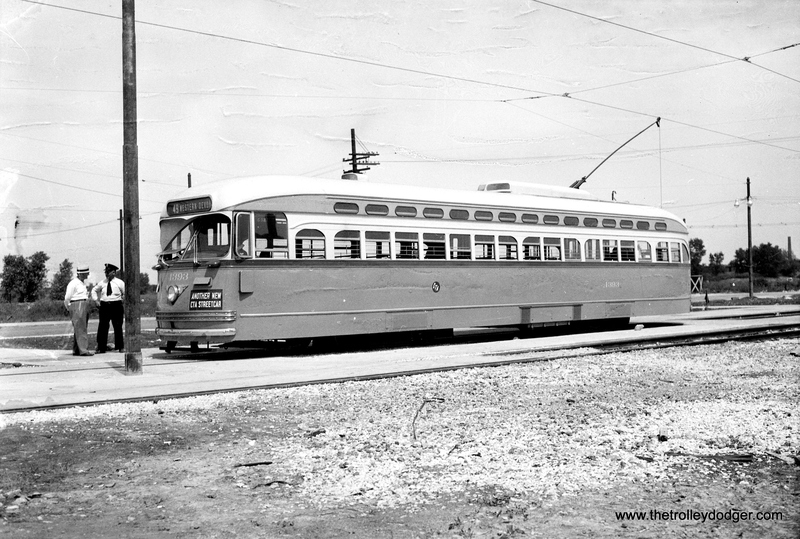 For transit on the fair grounds themselves, I am pretty sure they used buses of a type similar to those used at the 1939-40 New York World’s Fair. 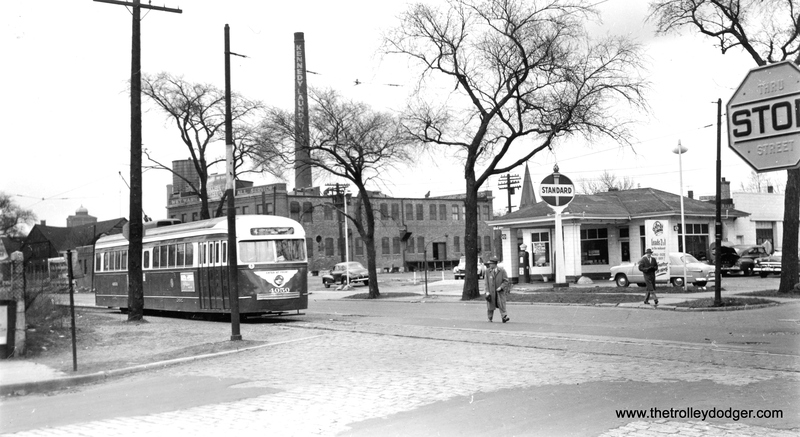 The Century of Progress grounds stretched for three miles along the lakefront, from Roosevelt to 39th. 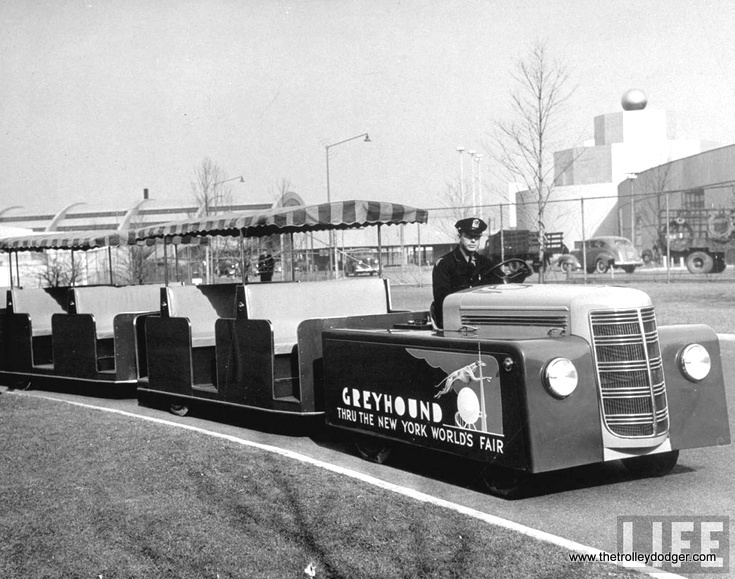 Greyhound got the concession for motorized transport within the fairgrounds, driving these open-air trailer conveyances along a portion of Leif Eriksen Drive that later was part of South Lake Shore Drive. 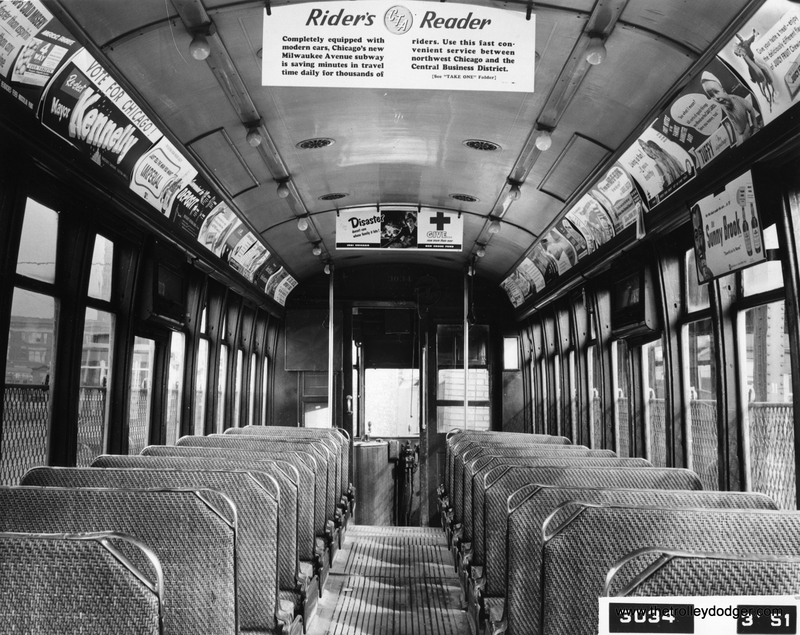 Within the exhibits area, where motorized vehicles weren’t allowed, you could ride in a pushchair, providing summer employment to dozens of high school and college students. 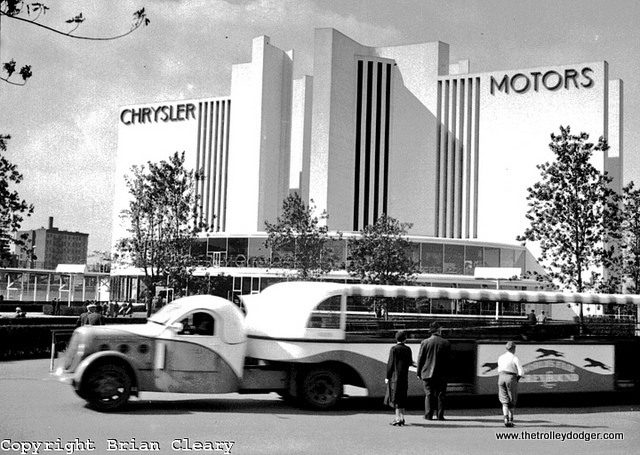 Similar buses (actually, they look more like trucks) were also used at the 1939-40 NY World’s Fair. 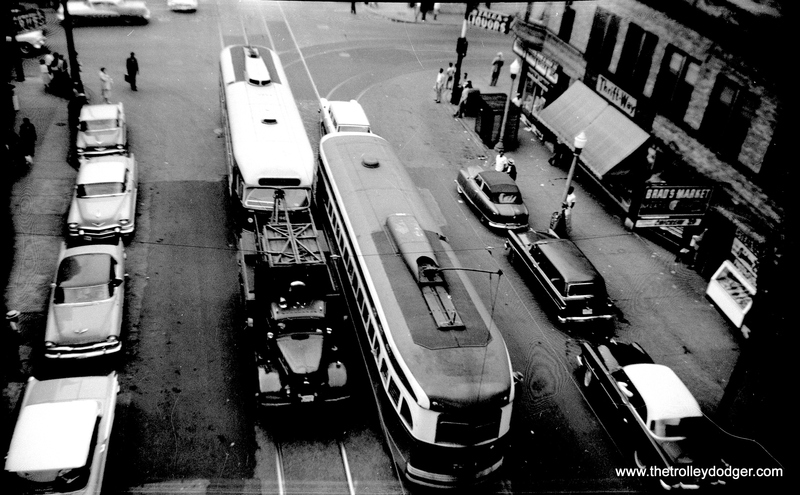 As it tuns out, they were not the same vehicles. This is explained in an article from Hemmings Motor News. 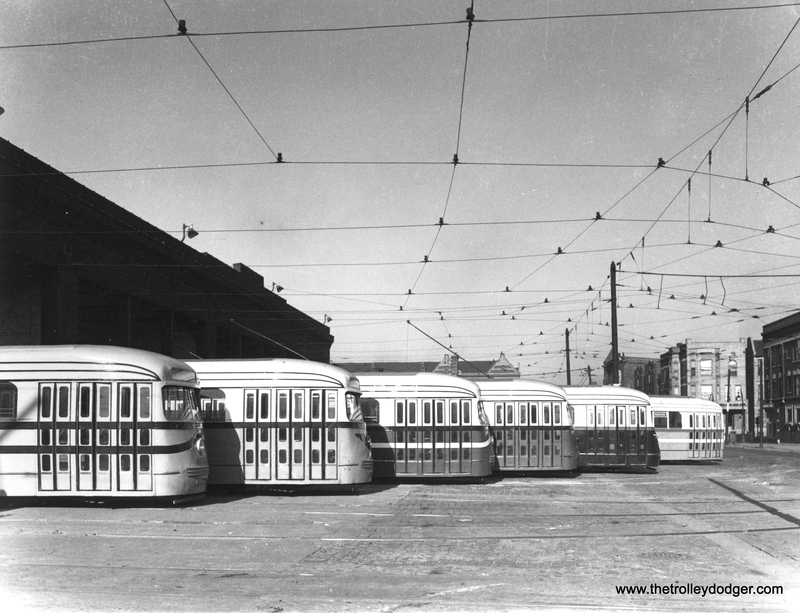 Apparently, the Chicago buses used at the fair were one-offs made by General Motors. 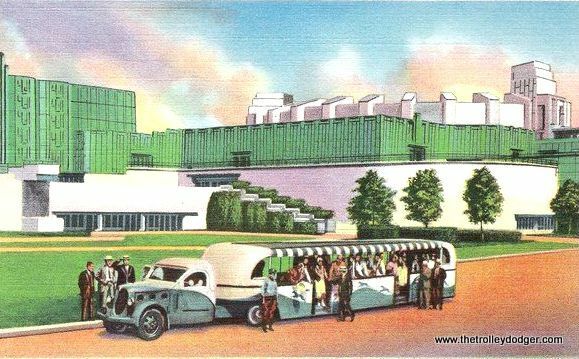 There were at least two types of buses used at the New York World’s Fair, a “tractor train” and a more streamlined bus. 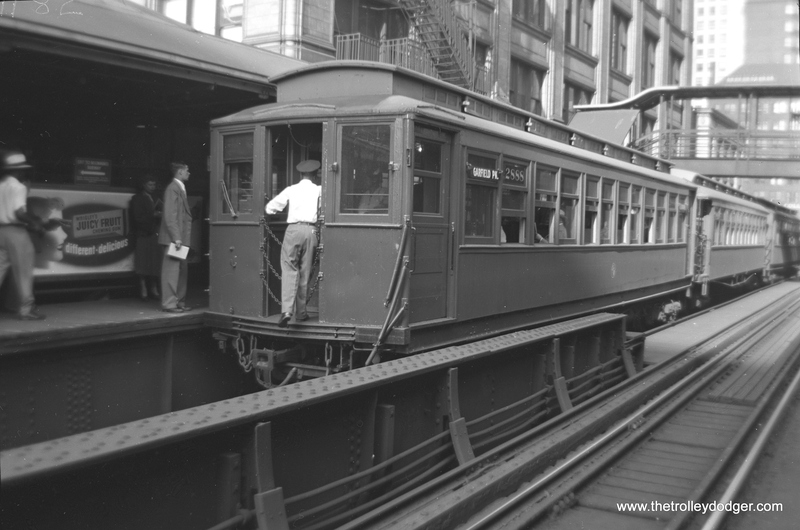 Neither looks much like the ones used in Chicago. 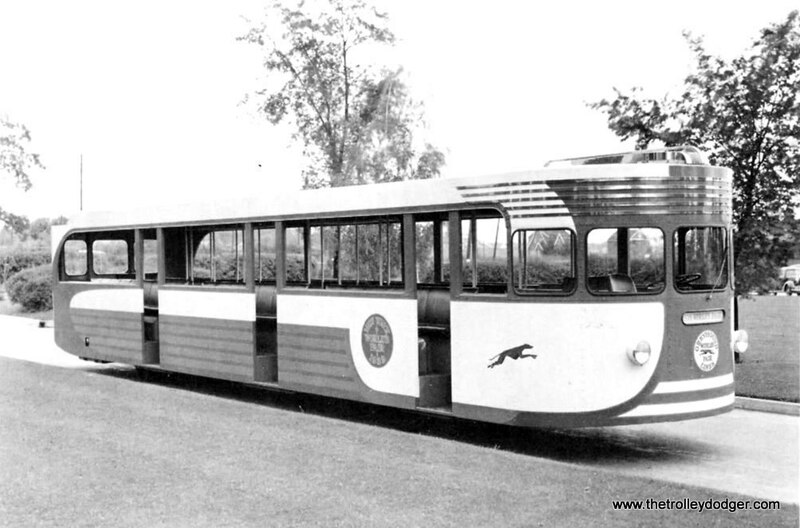 The streamlined buses were made by Yellow Coach. 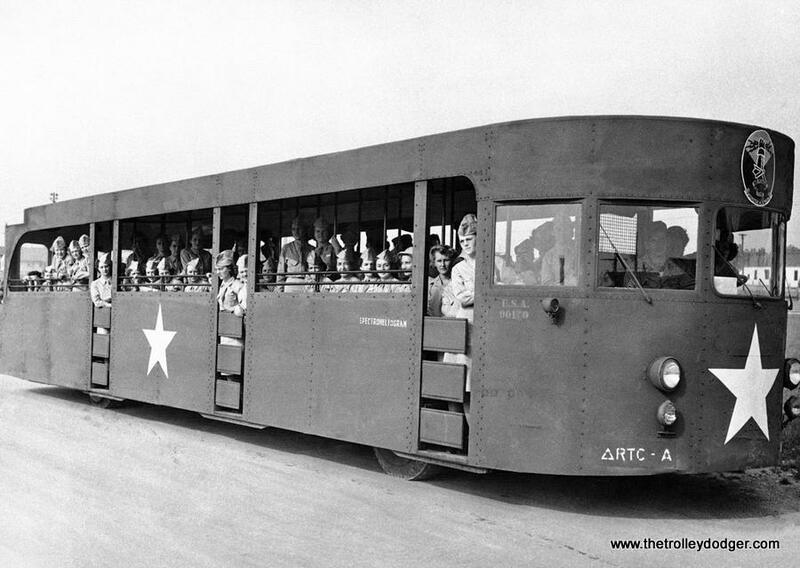 After the fair ended in 1940, some of the streamlined buses were used to transport WAACs. 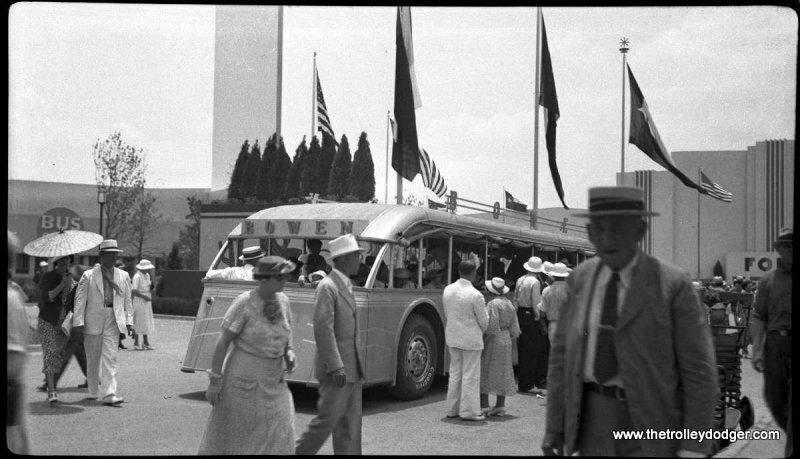 The question has been raised as to whether or not the Chicago buses were then sold to Bowen Motor Coach for use at the Texas Centennial Exposition in 1936. 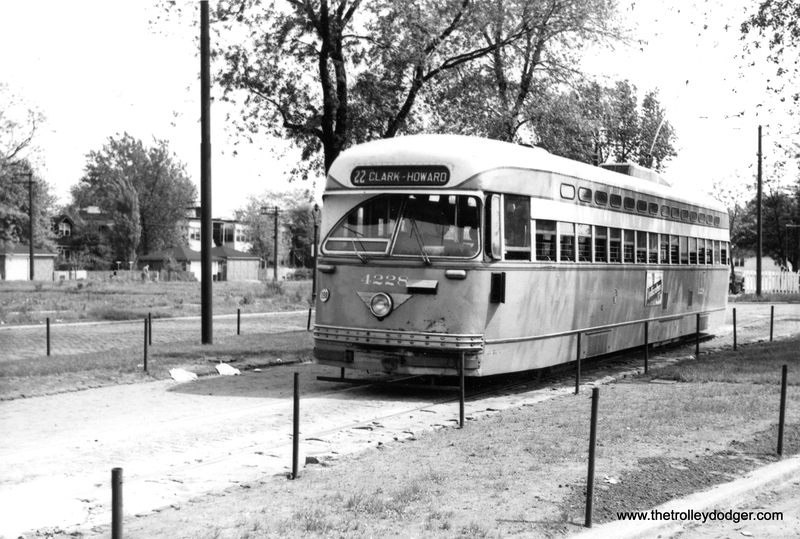 You can see pictures of the Texas buses below, and there is also a quick view of them in a video clip here. 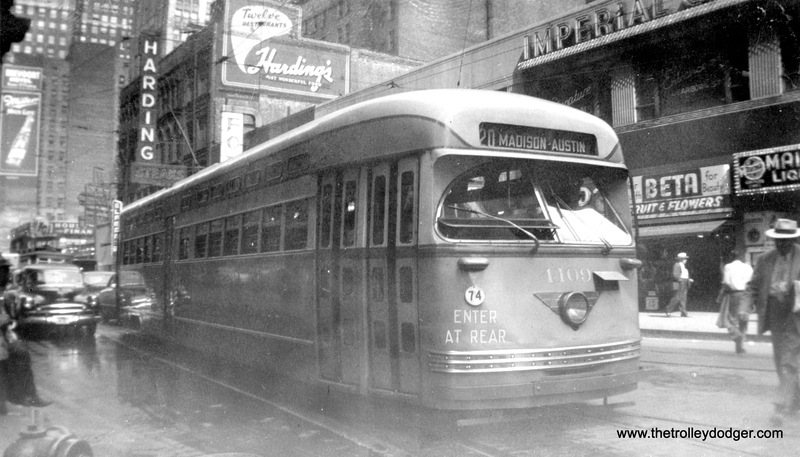 At this point, it’s not clear whether they were the same buses that were used in Chicago with a bit of new sheet metal attached, or simply similar buses built later by General Motors. 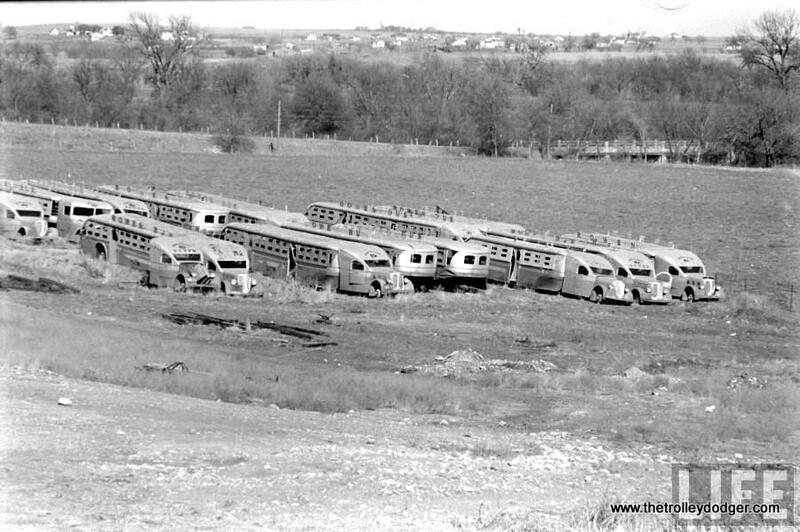 Buses purported to be those from the 1933-34 World’s Fair, shown in Texas in 1939, where they were owned by the Bowen Bus Company. 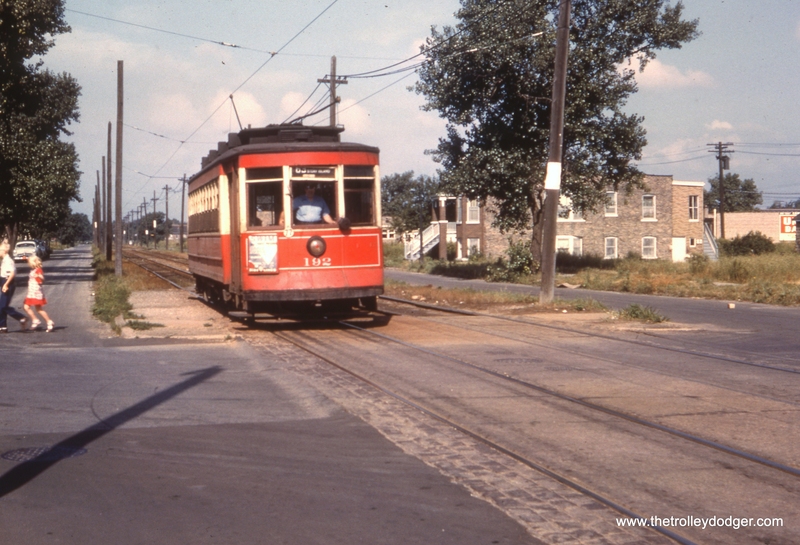 LVT 1006 heads from Norristown to Philadelphia over the P&W in June 1949. 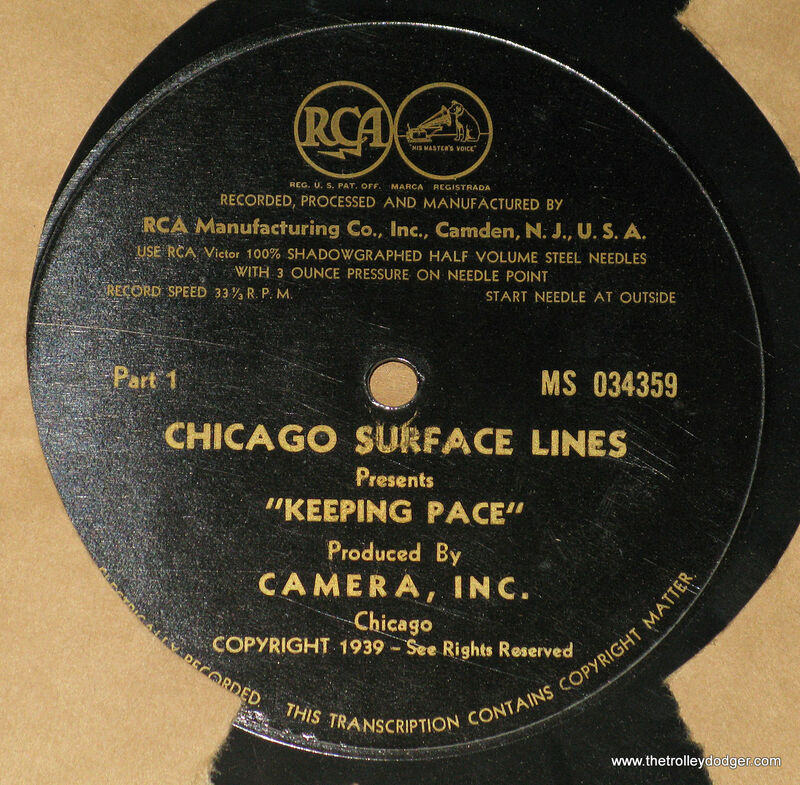 We have a unique opportunity to buy a 16″ transcription disc made by the Chicago Surface Lines‘ public relations department in 1939. Chances are, this is a 30-minute radio program promoting CSL, most likely played a few times on local radio stations, and has been unheard since then. 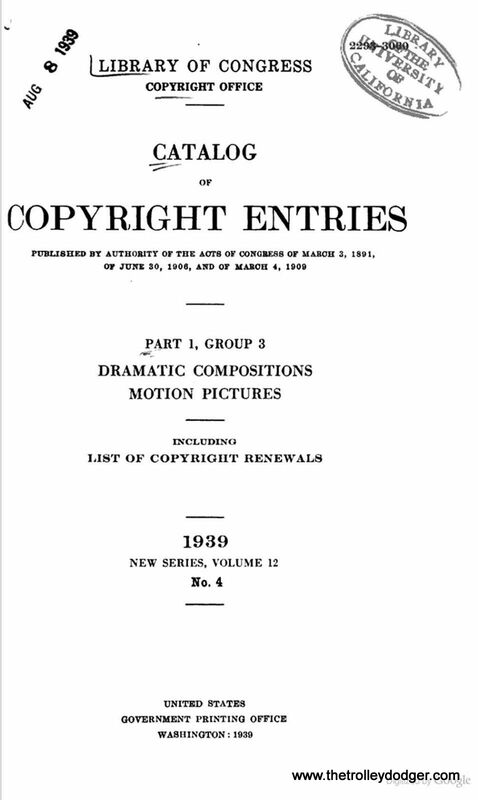 The script was written by Hollis Farley Peck (1909-1971). 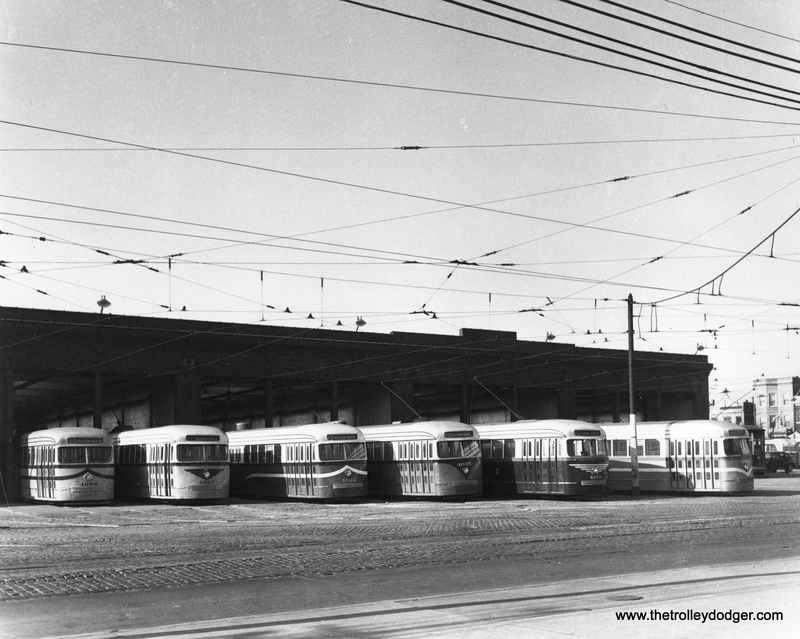 For all we know, this recording may include the sounds of Chicago streetcars, which would be very rare. It will not be easy to play this record due to the large (16″) size. 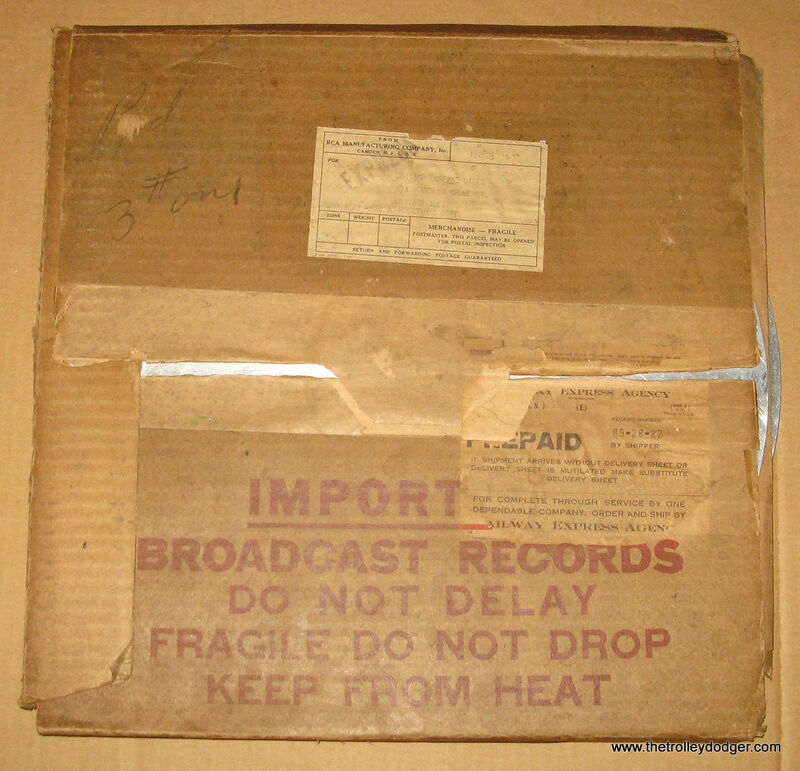 Although this is a 33 1/3 rpm record, it used the same technology as the 78 rpm records of its time. 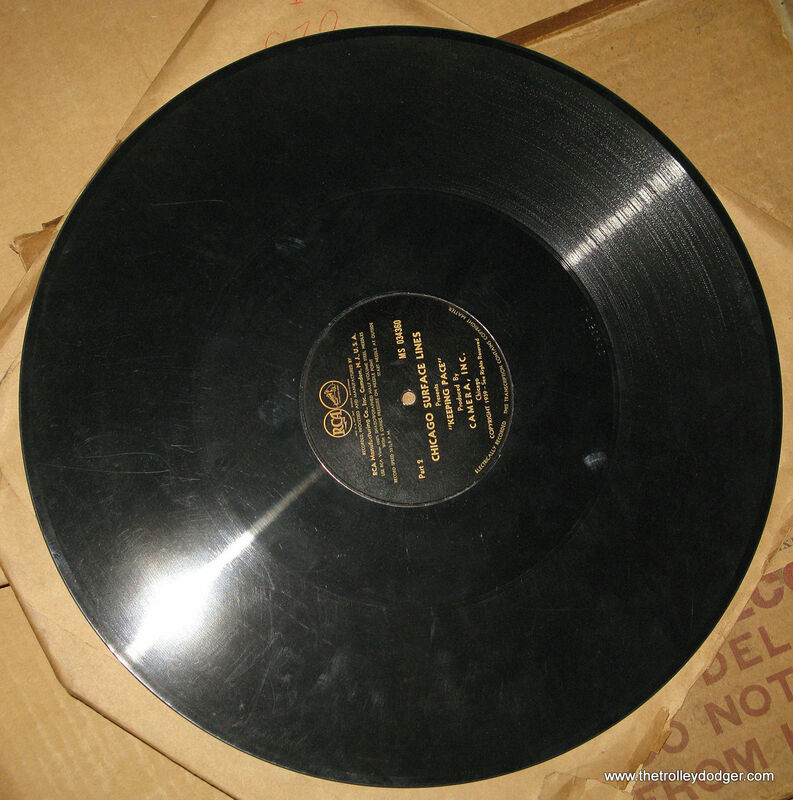 The current LP system of vinyl records did not come about until 1948. 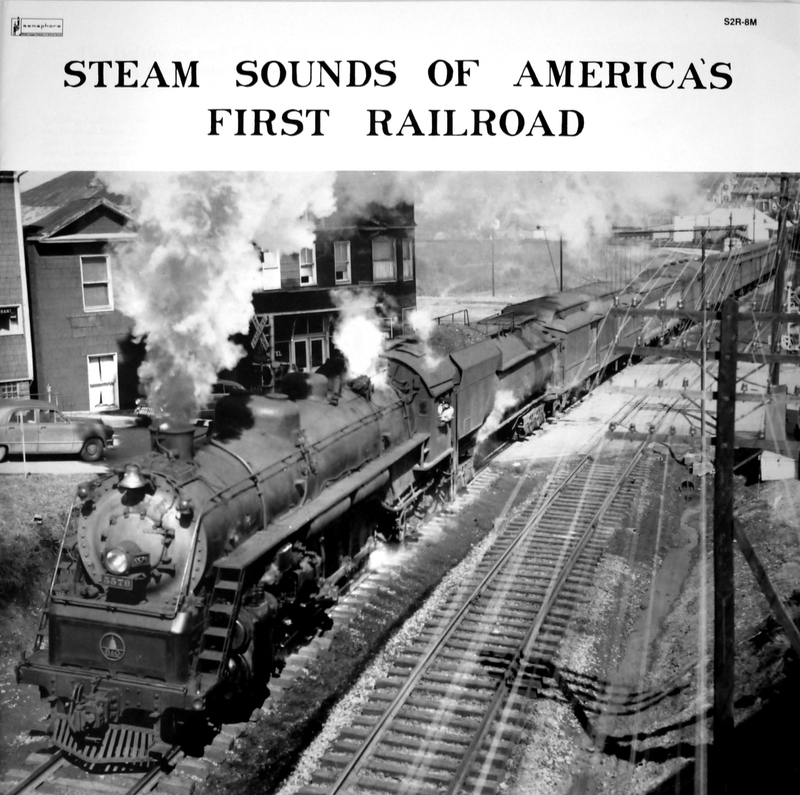 Such large recordings were necessary to provide a longer running time than a standard 78 rpm record, which could only last about 3:20. I assume that each side of this transcription disc has 15 minutes on it. 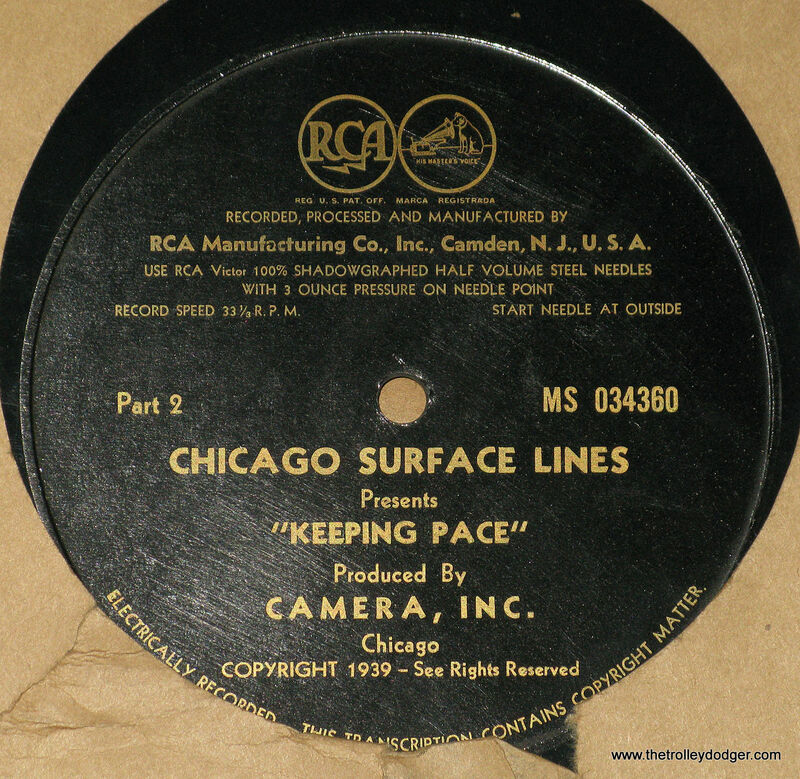 Once I have the record, I plan to consult with the Museum of Broadcast Communications here in Chicago. Possibly they may have the necessary equipment for playing it. If a successful recording can be made, we will digitally remaster it and issue it on a compact disc. 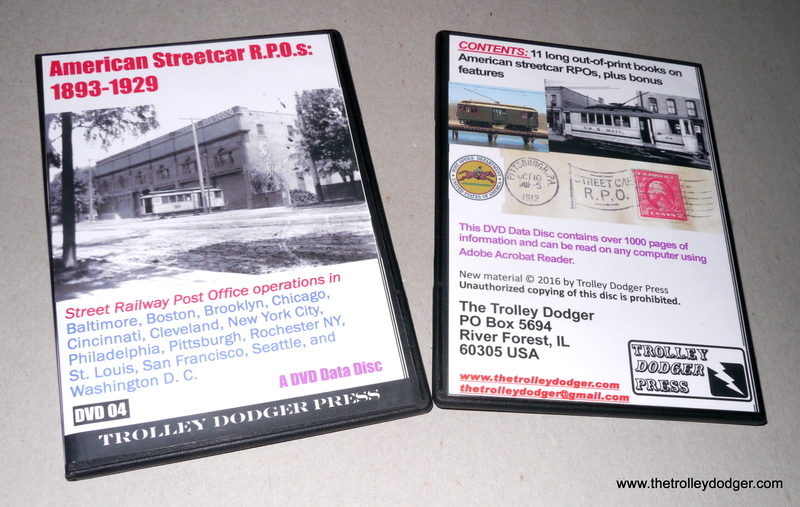 If MBC can help us, we may donate the original disc to the museum for their collection. 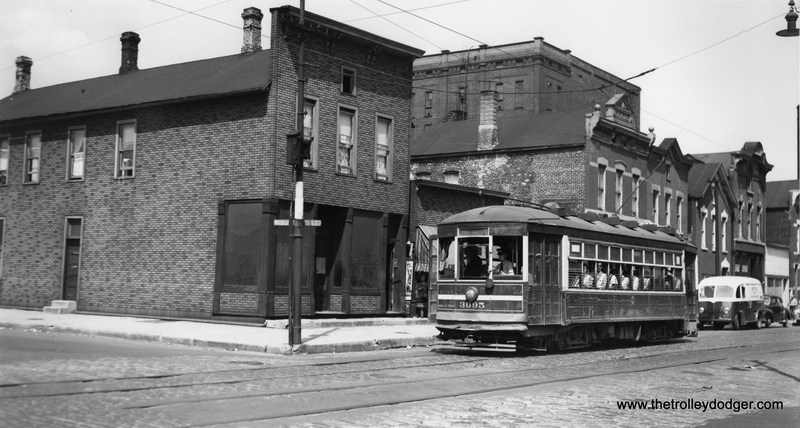 After all, this is local history. However, before we can do that, we first have to complete the purchase. 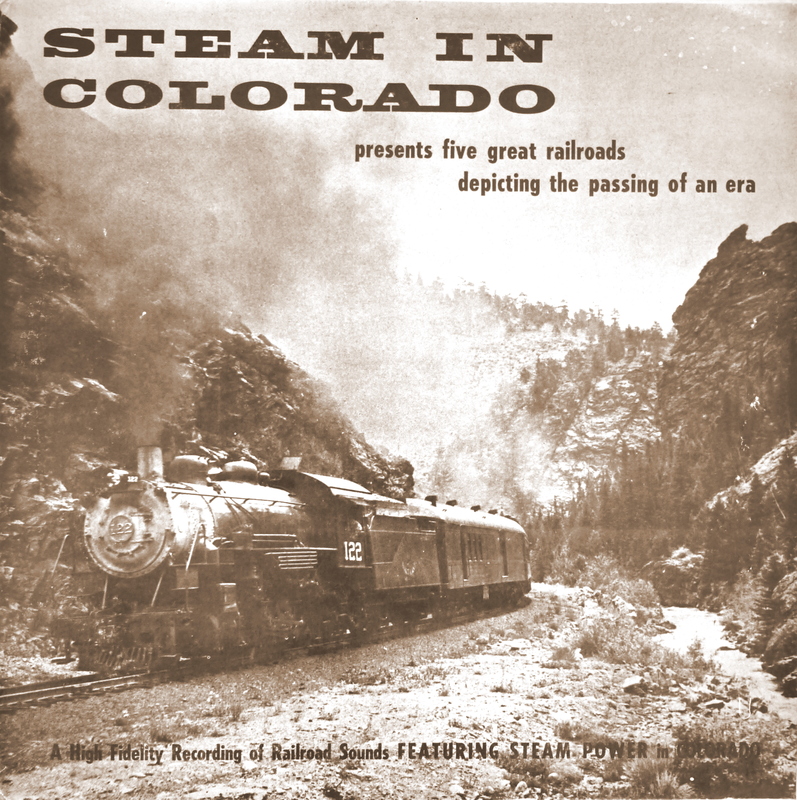 If you can help contribute to the $60 cost of this rare recording, your donation will be greatly appreciated. 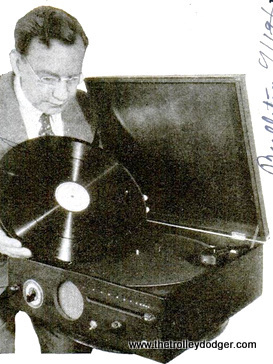 Specialized equipment is required to play a 16″ transcription disc. 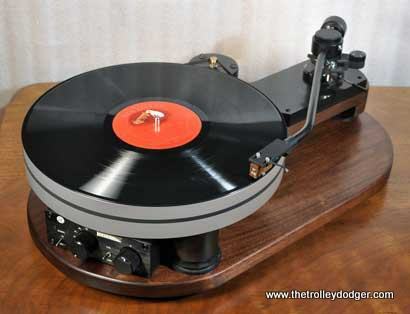 This is one such turntable made by Esoteric Sound. A 1936 phonograph for playing transcription discs. This one played records from the inside out, with a maximum running time of one hour per side. 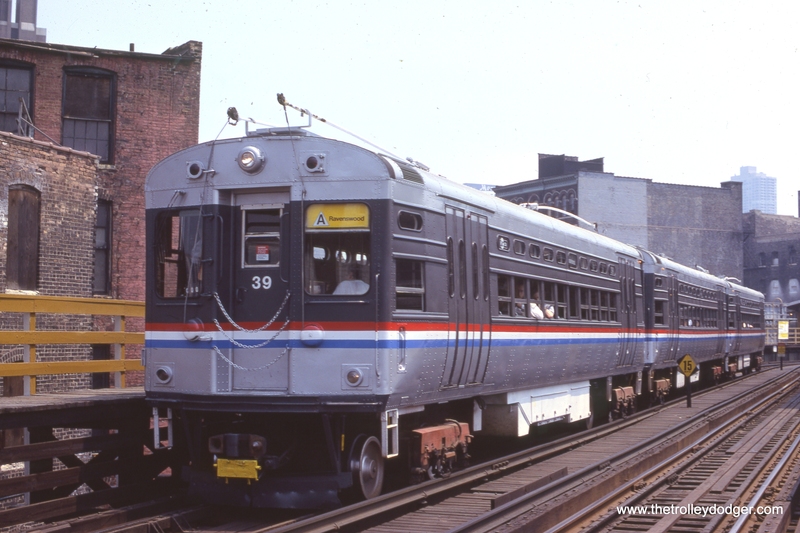 This is our 130th post, and we are gradually creating a body of work and an online resource for the benefit of all railfans, everywhere. 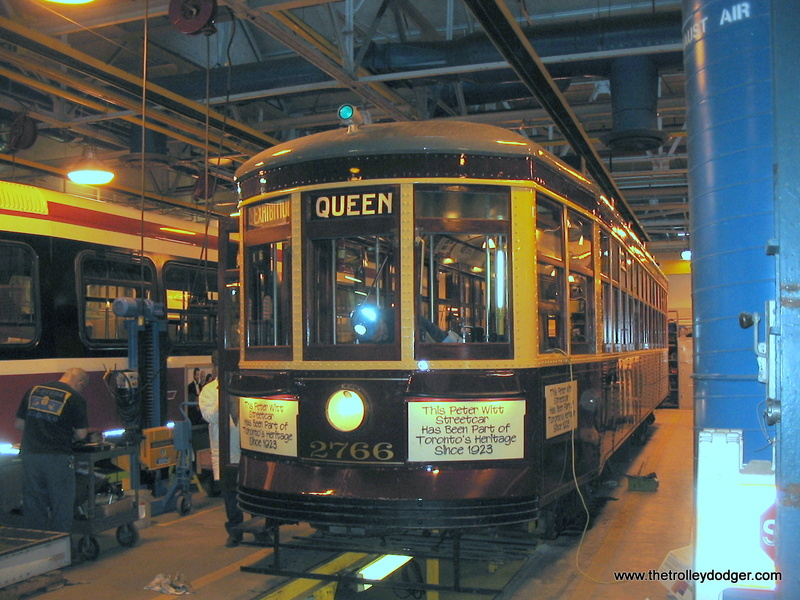 To date, we have received over 141,000 page views, for which we are very grateful. 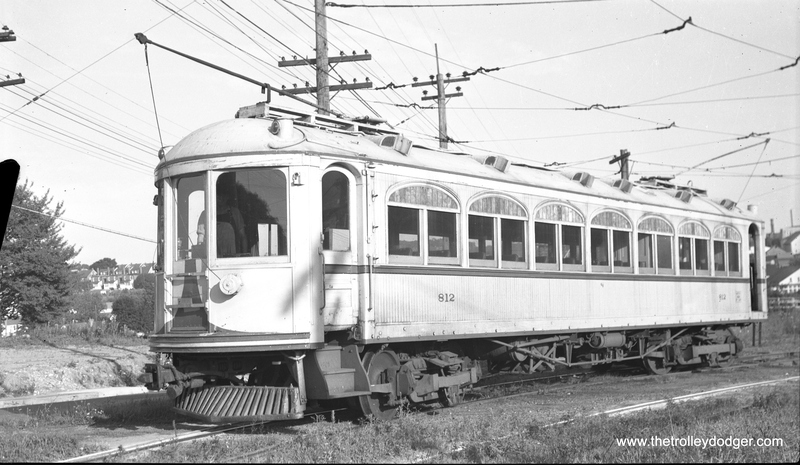 LVT 1030 at Acorn Siding on August 19, 1951, less than a month before the Liberty Bell Limited interurban was abandoned. 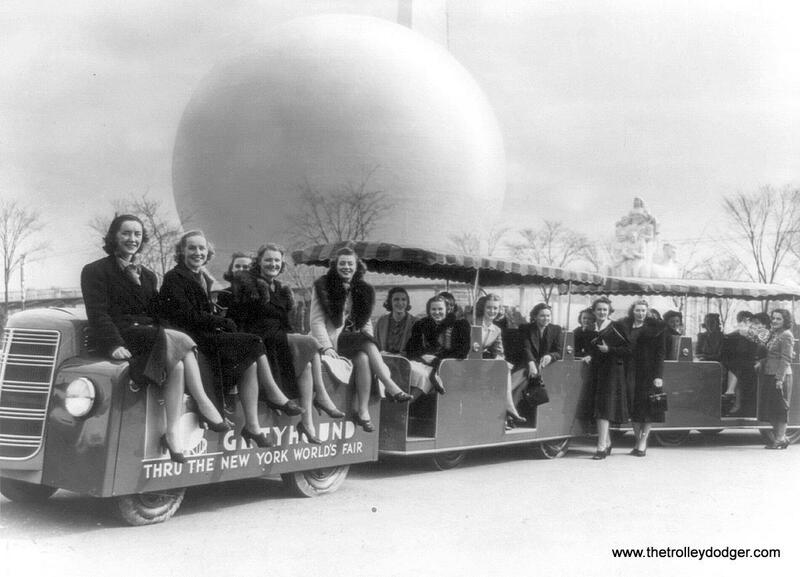 Today, we take a bit of a spring break from our usual Chicago-area posts to head for other parts. In fact, we have a veritable alphabet soup of other properties to offer, with the most notable letters being LVT, DCT, and CO&P. 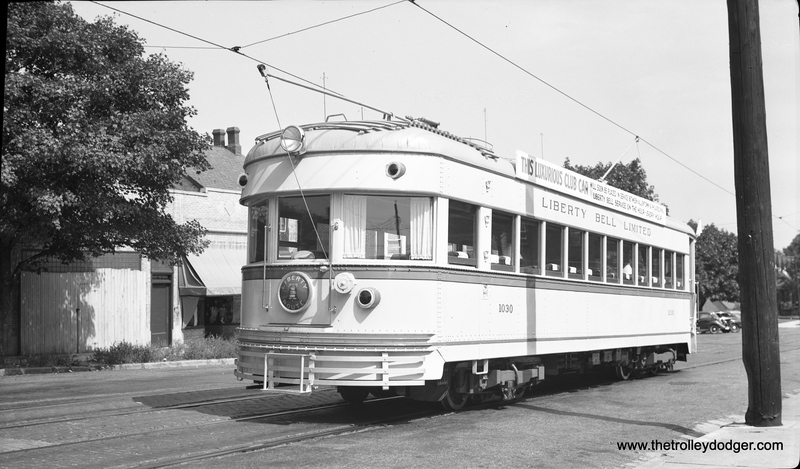 LVT stands for Lehigh Valley Transit, a Pennsylvania streetcar and interurban operator based out of Allentown. 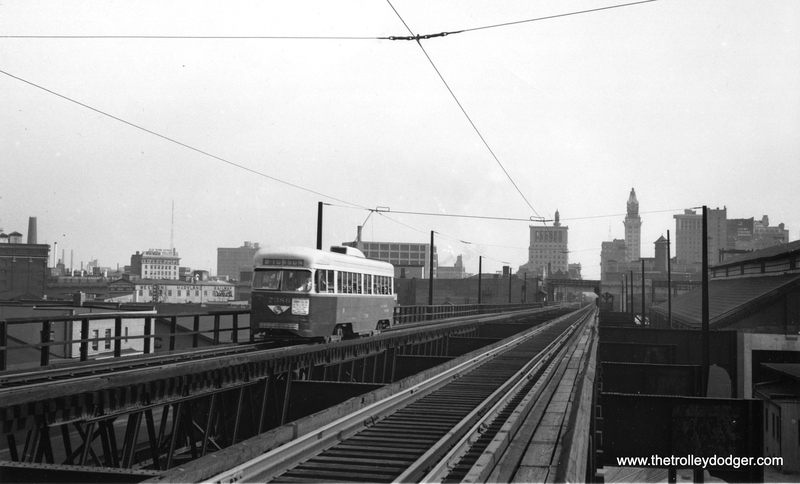 We have featured LVT photos on a couple of other occasions, and there are many great ones, LVT being one of the most well-documented transit networks of its time, the first half of the 20th century. 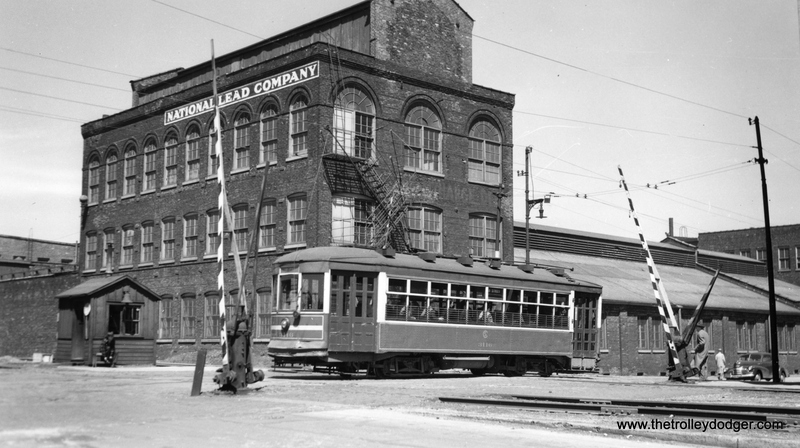 I would say that anyone who is a fan of the Chicago, North Shore & Milwaukee, the fabled North Shore Line, might very well like LVT’s Liberty Bell Limited too. 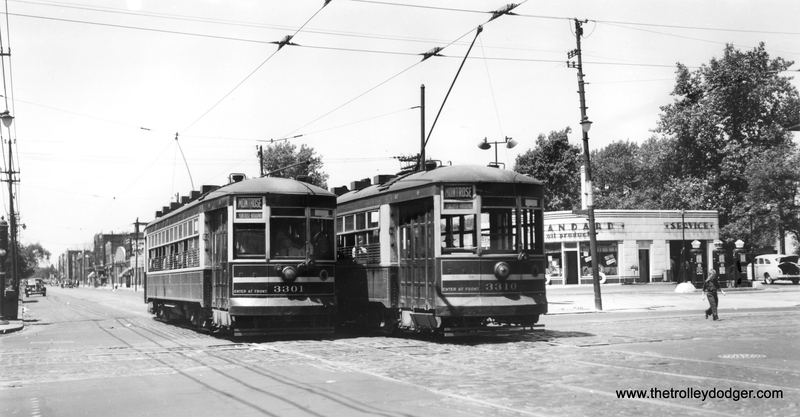 They both operated at high speeds over long distances, but there were significant differences too. 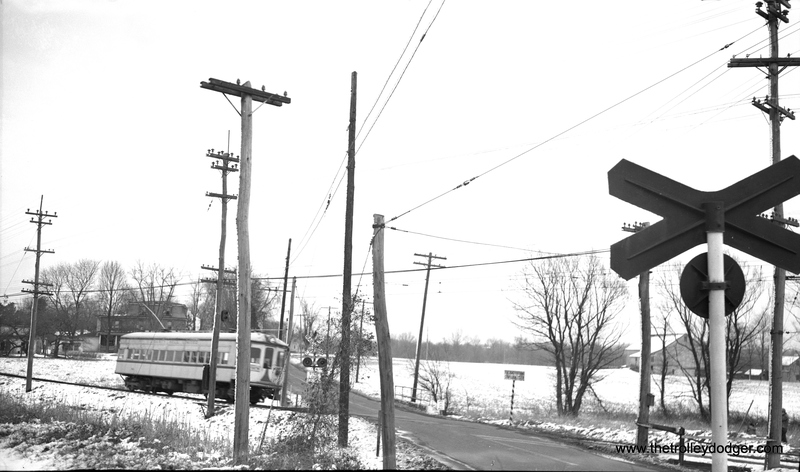 While the North Shore Line ran largely on flat Midwest plains, LVT had to contend with various hills and mountains, which presented numerous challenges. 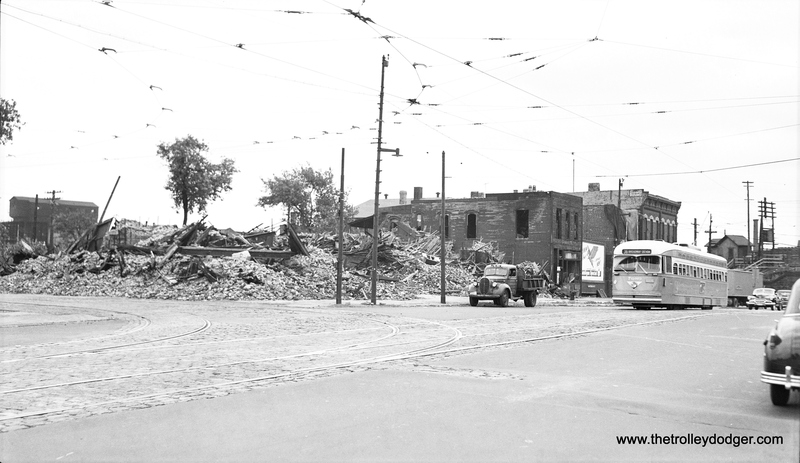 LVT pulled off a very successful modernization between 1938 and 1941, which served them well during the difficult war years that followed. 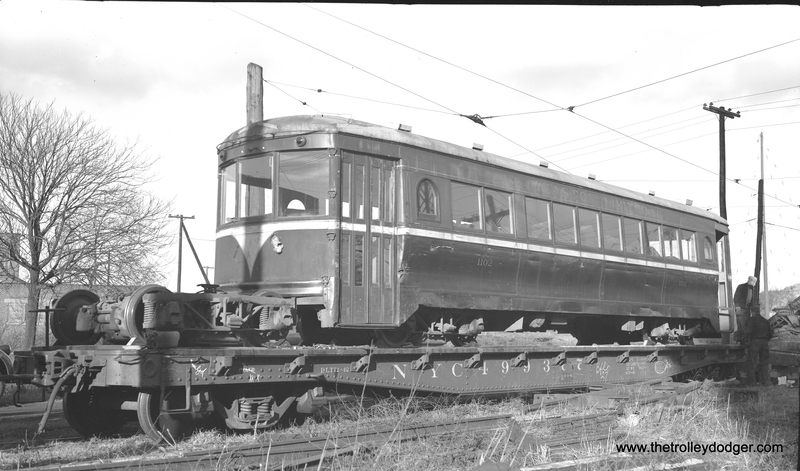 It’s a shame that they were only able to buy one of the Indiana Railroad lightweight high-speeds to go along with a dozen or so ex-Cincinnati & Lake Erie “Red Devils.” The IR cars could be coupled together and sometimes ran as many as three in a train, which LVT could not do with the C&LE cars. 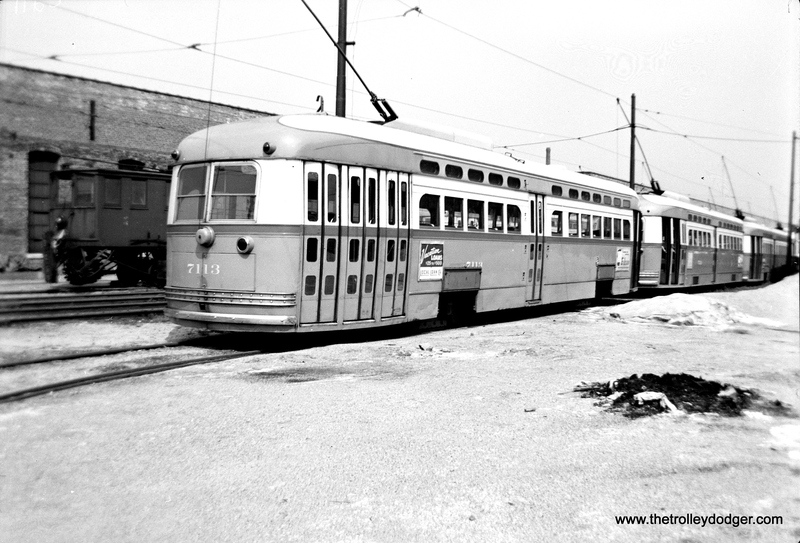 The C&LE interurban had no use for multiple unit operation, as they barely had enough power supply to run the cars one at a time. 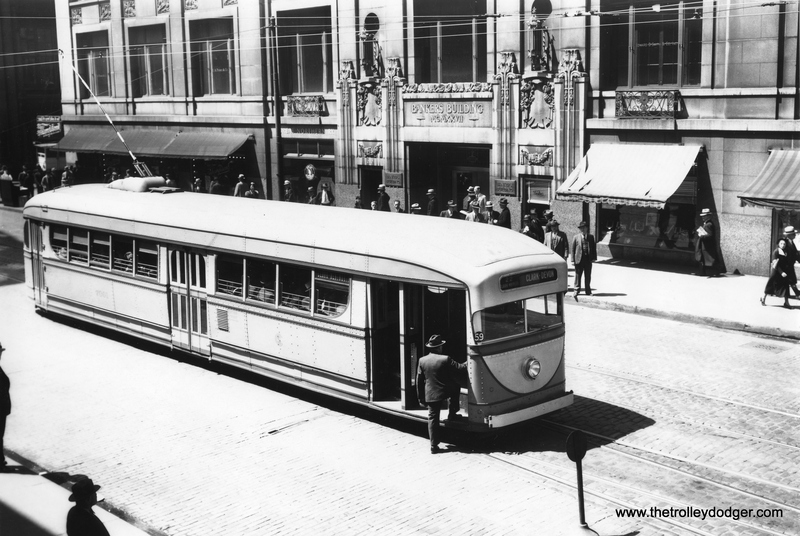 But LVT would have benefited from them, as during World War II it often had to run multiple cars closely following each other in order to meet demand. 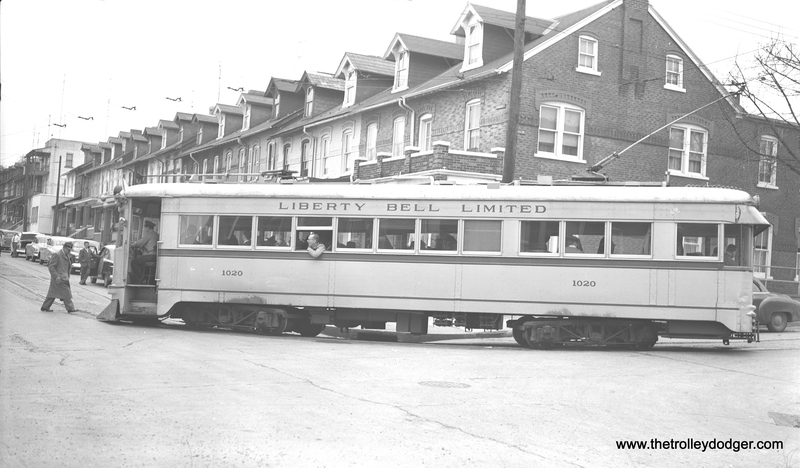 Since the Liberty Bell Limited was mainly single track with numerous passing sidings, this was an accident literally waiting to happen. 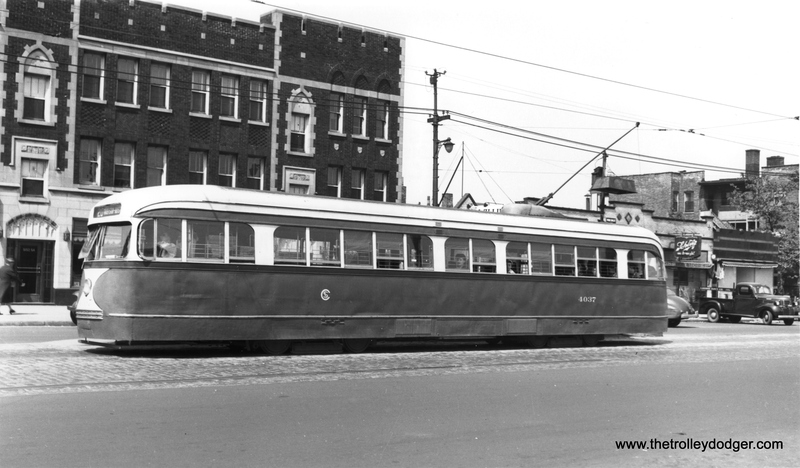 Some bad accidents did take place, which signaled the beginning of the end for the storied interurban, which ceased running in September 1951. 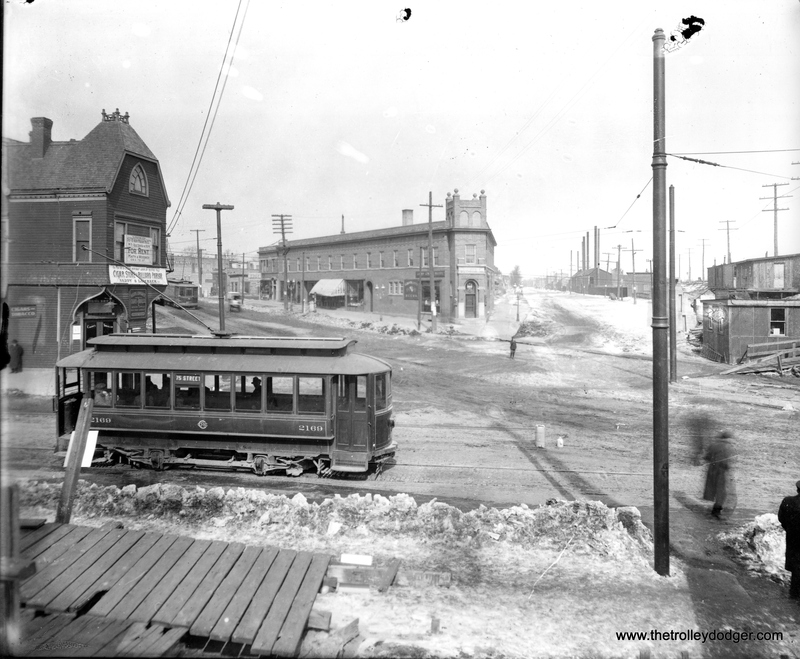 If you like these LVT photos, we posted more here back on December 14. 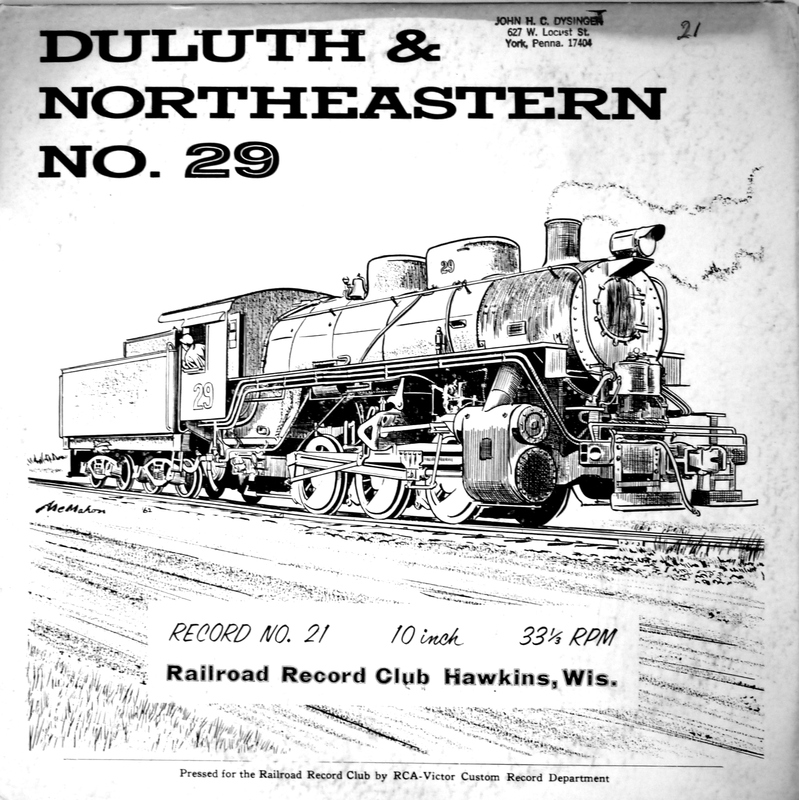 Railfan and Railroad magazine also gave B-147 an excellent review in their March 2016 issue. 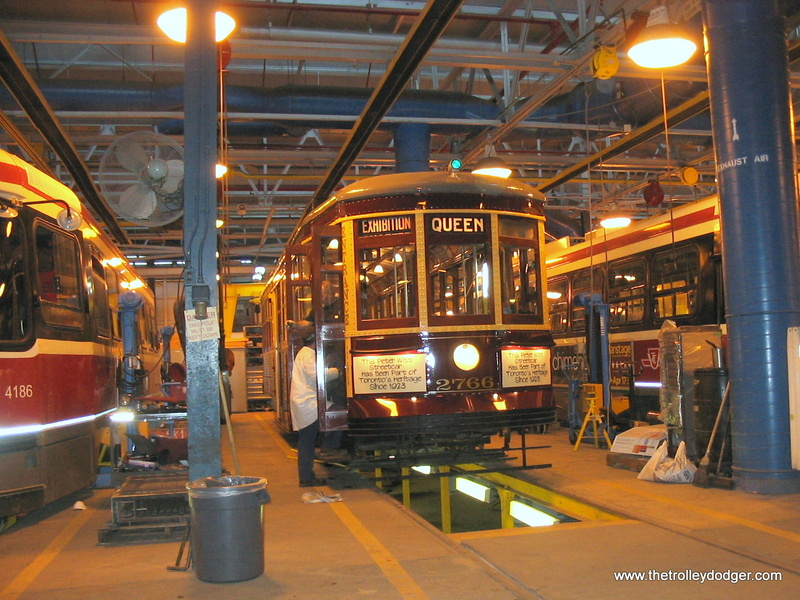 While few LVT cars were saved, 1030 is lovingly preserved at the Seashore Trolley Museum in Maine. 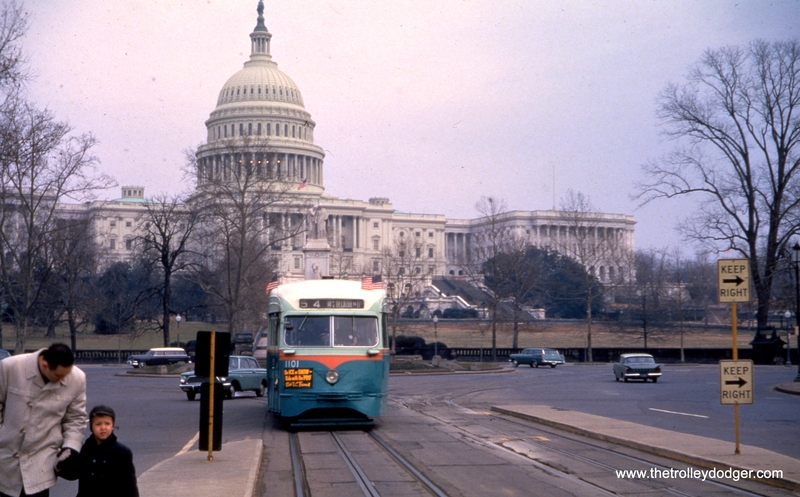 Streetcars have finally returned to the streets of Washington, D. C. after an absence of 54 years. 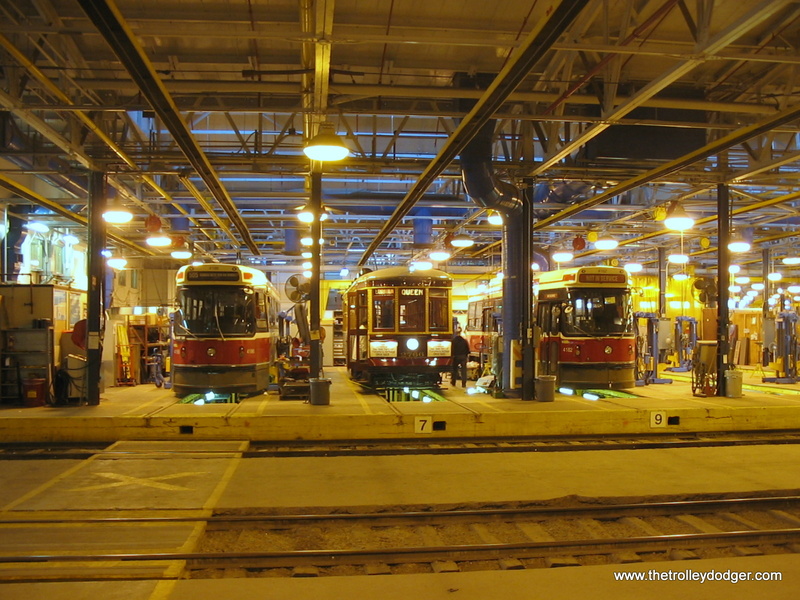 While this has surely been controversial, mainly because of some very protracted delays and testing that ran on for years, they are back and that is a good thing, since people in general like streetcars. They are increasingly seen as an urban development tool, and more often than not, new systems soon lead to line extensions. 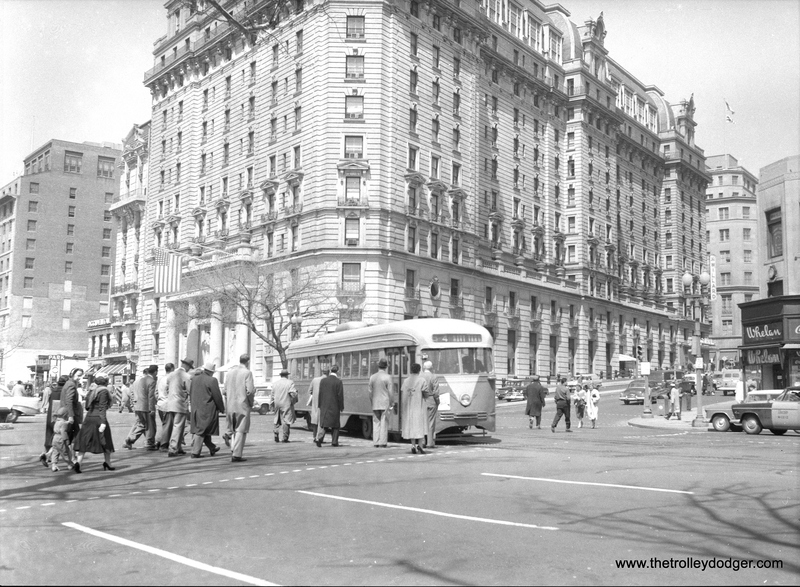 However, it’s also good to remember the fine system that the District of Columbia once had. If we could only have kept much of what there was, we would probably be better off today. And this is a lesson that must be learned in order to avoid repeating the mistakes of the past. 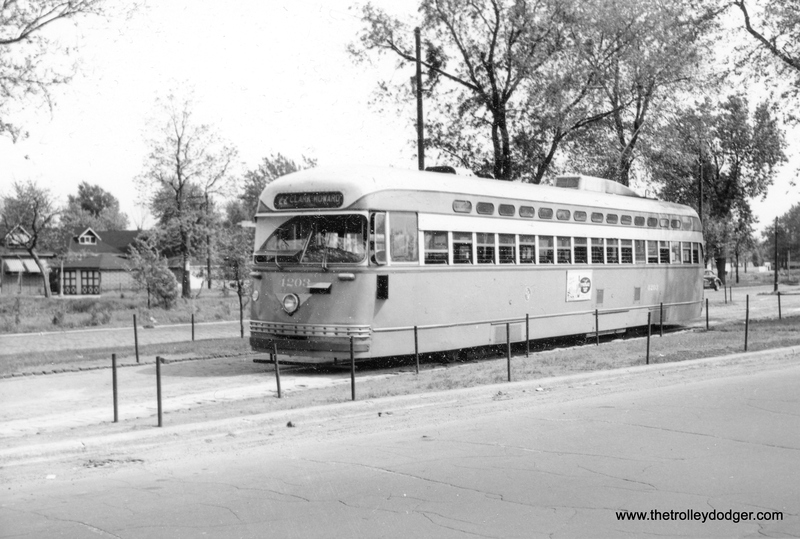 So, we offer some fine photos of both DC Transit and its predecessor, Capital Transit. 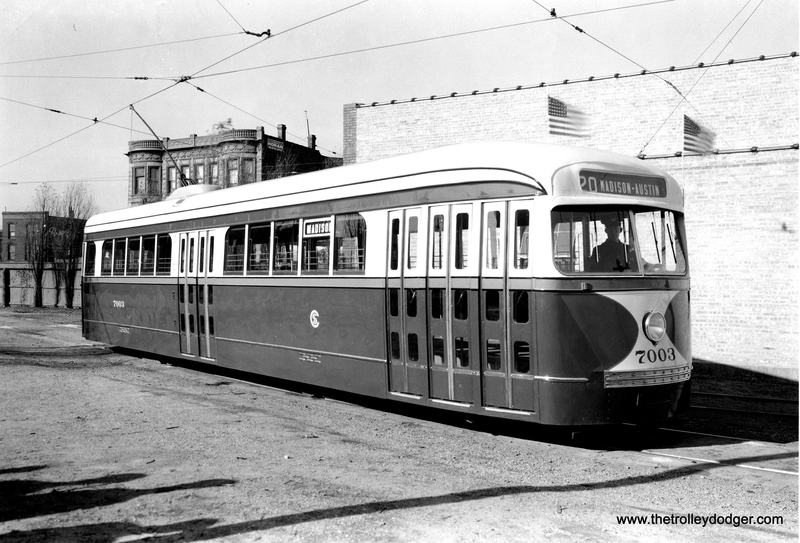 DC Transit wanted to keep running streetcars but was forced to abandon by Act of Congress. 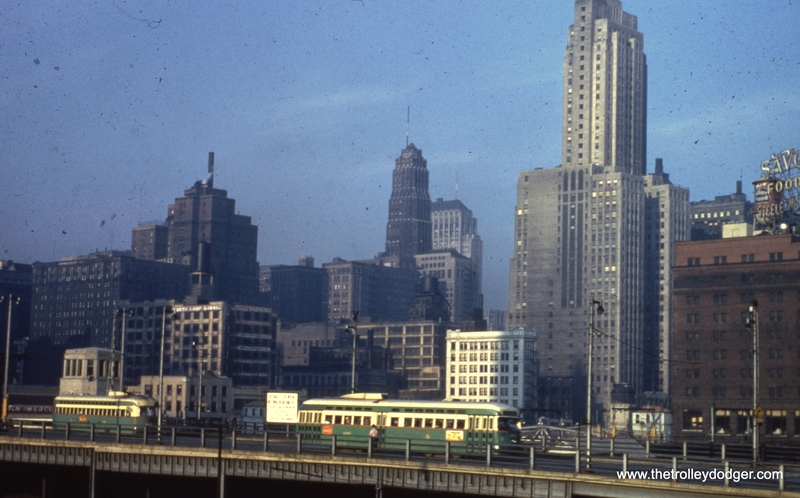 Our last bit of “alphabet soup” is the Chicago, Ottawa & Peoria, which never actually made it to Chicago, except via a connecting interurban. 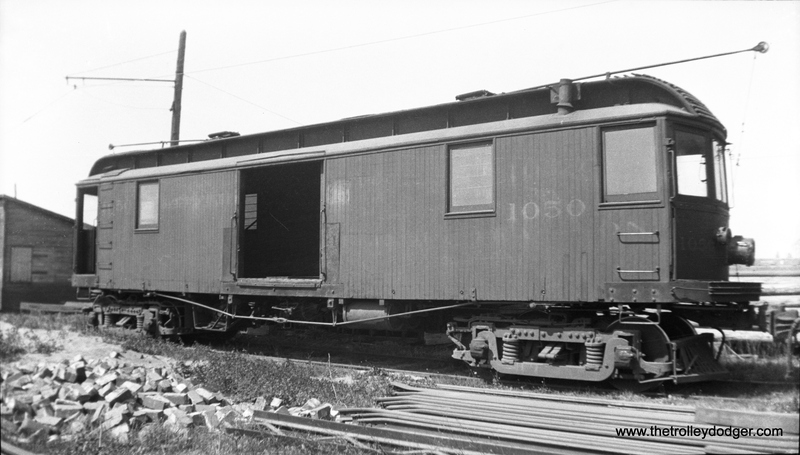 Once it lost this connection, it could not survive the Great Depression, and service went out in 1934. Therefore, it should be no surprise that photos of the CO&P are extremely scarce and many of the pictures we do have are post-abandonment. 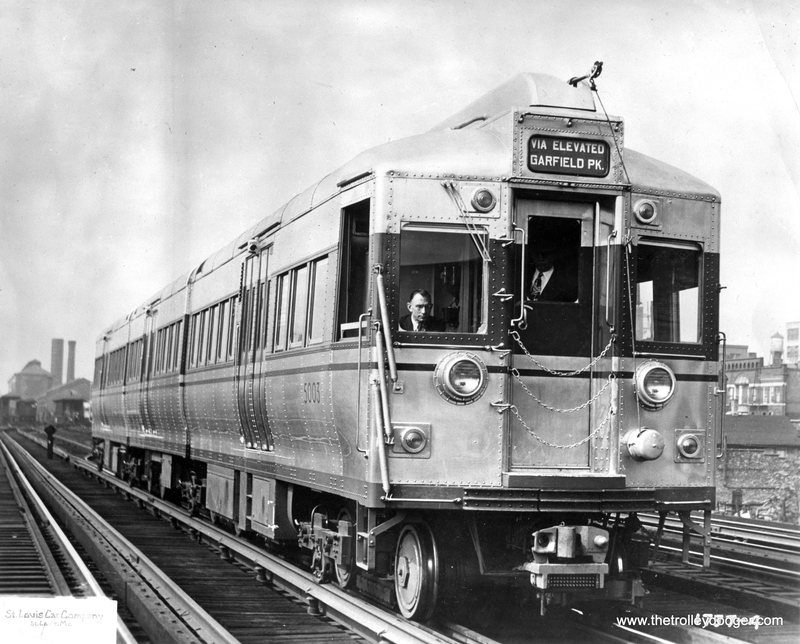 The railfan movement was in its infancy in 1934. 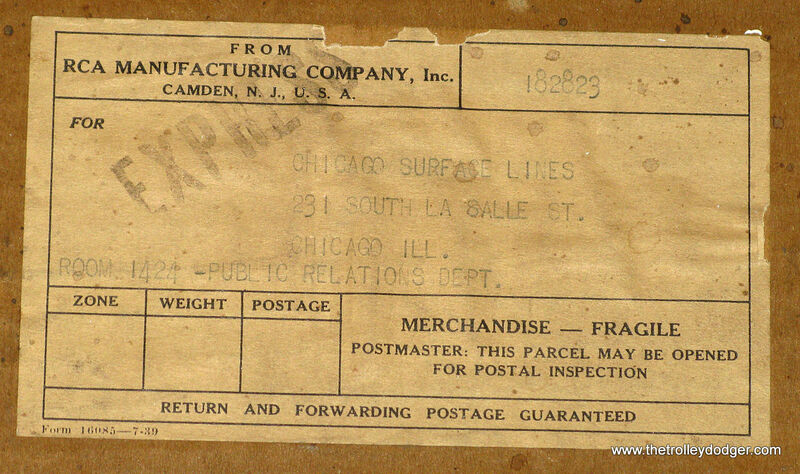 The CO&P had another alphabet connection, and that is to the IT, or Illinois Terminal. 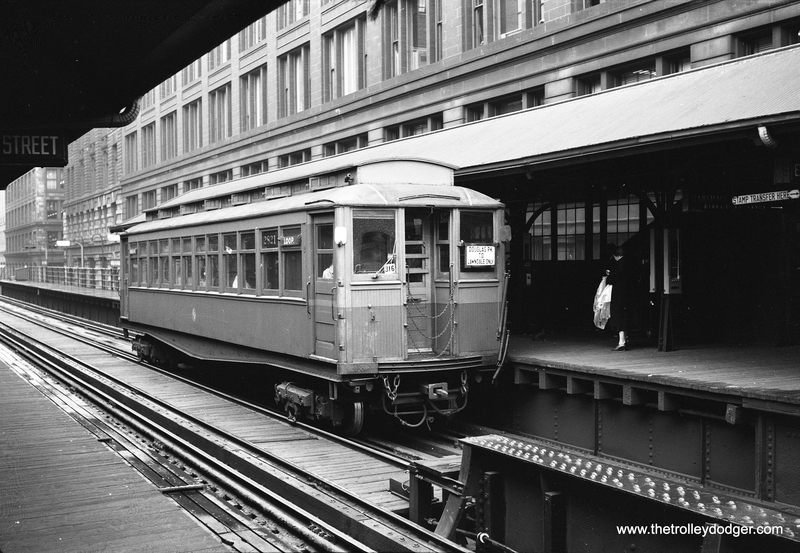 It was a part of the Illinois Traction System, later reorganized as the Illinois Terminal Railroad, although its interurbans did not connect with the others owned by its parent. 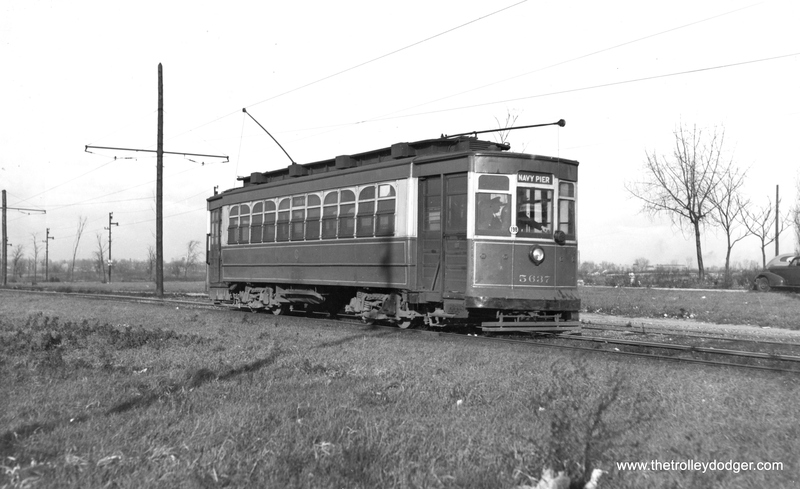 Some of its equipment did find later use on IT, however, including IT city streetcar 415, now at the Illinois Railway Museum. 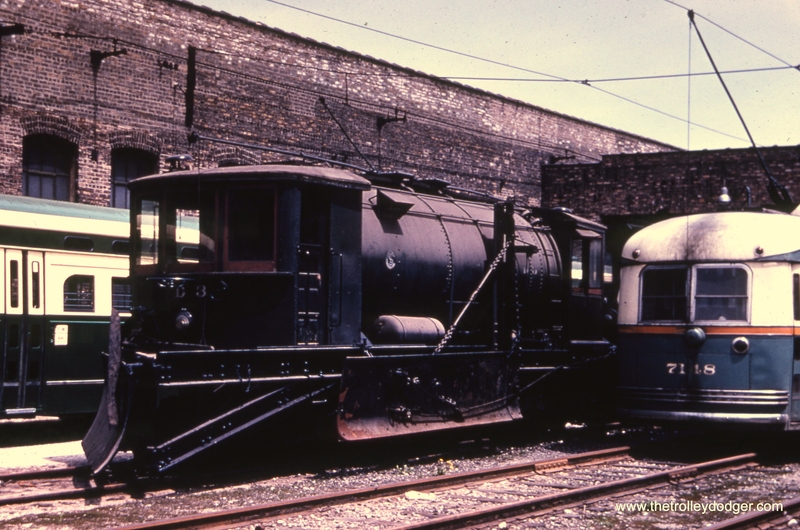 Here are four rare CO&P photos for your enjoyment. PS- We have three new audio CD collections available for your listening pleasure. See more details at the end of this post. 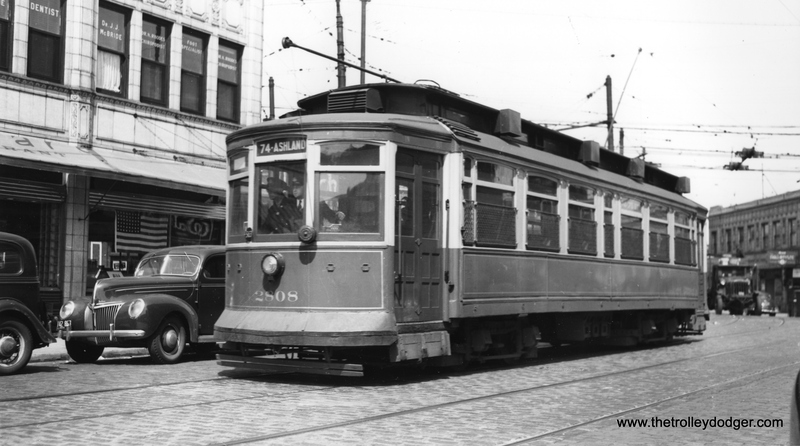 The former Indiana Railroad car 55, newly transformed into LVT 1030, at 8th and St. John streets on September 17, 1941. This is the rear of the car. Presumably, it’s making a backup move. 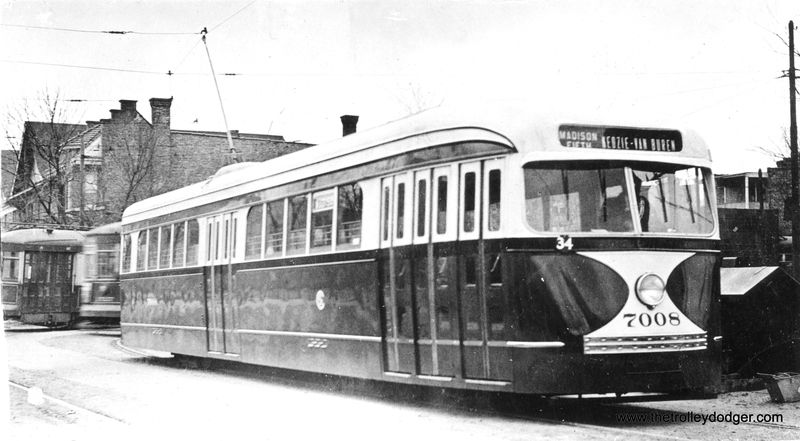 The success of LVT’s 1938-39 modernization program encouraged management to buy one more car, which became the jewel of the fleet. 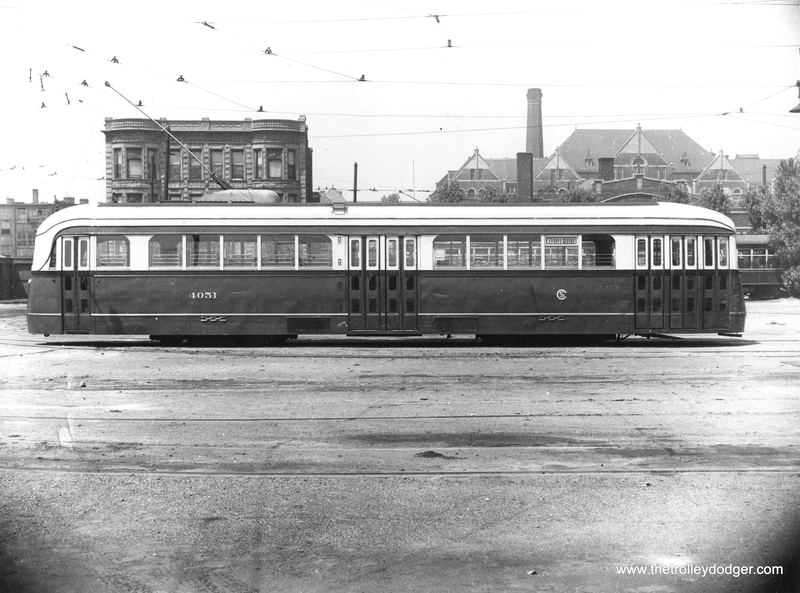 Note the rounded rear end as opposed to the squared-off ends of the similar ex-Cincinnati & Lake Erie cars. 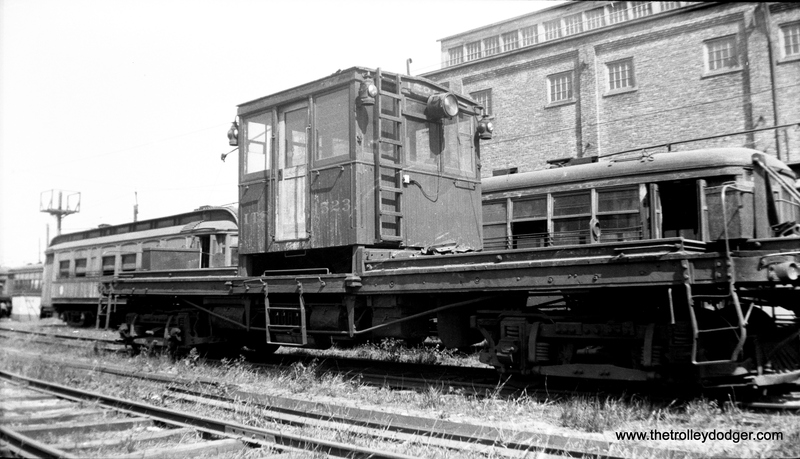 The difference is that the IR lightweights could operate in multiple units, and hence needed more clearance for turning. 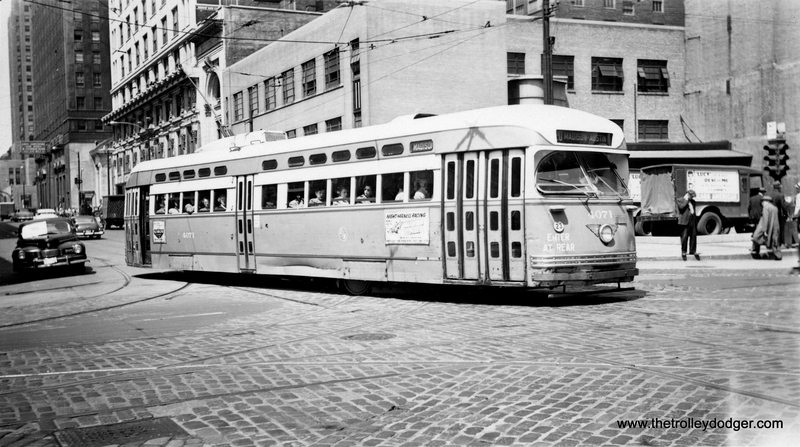 LVT 1002 picks up some passengers on Washington Street on April 1, 1951. 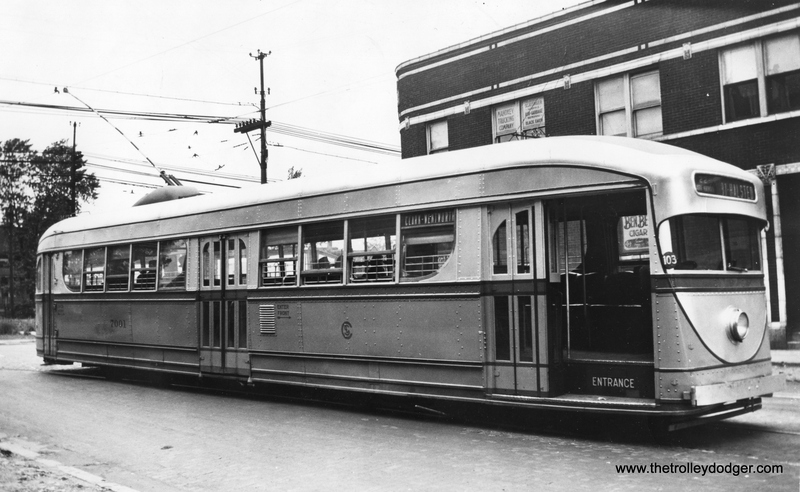 Note the dent on the front of the car. 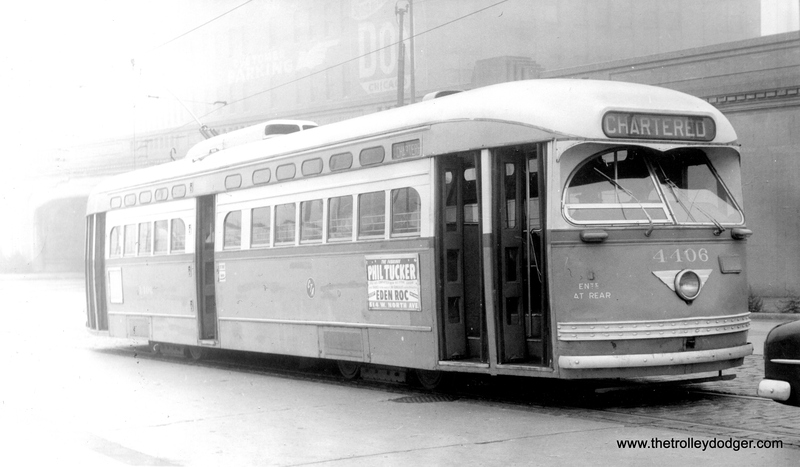 Don’s Rail Photos says, “1102 was built by Cincinnati Car in August 1929, #3025, as D&TRy 203. 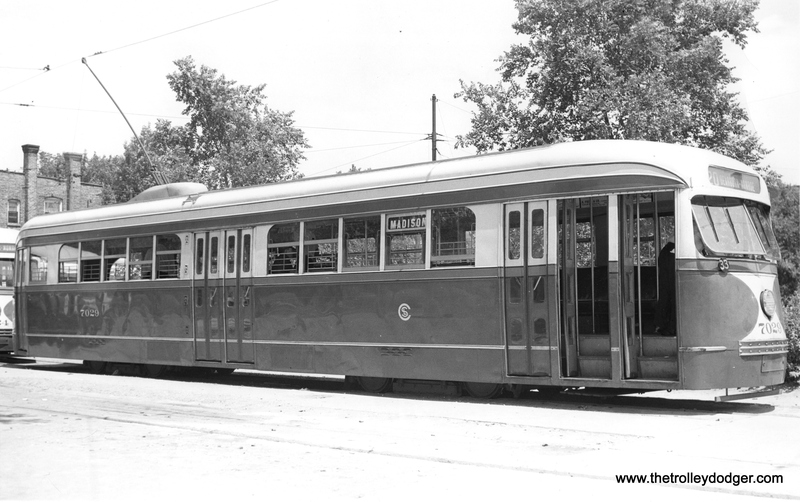 It was returned to Cincinnati Car in 1932, and in 1938 it was sold to LVT as 1102. 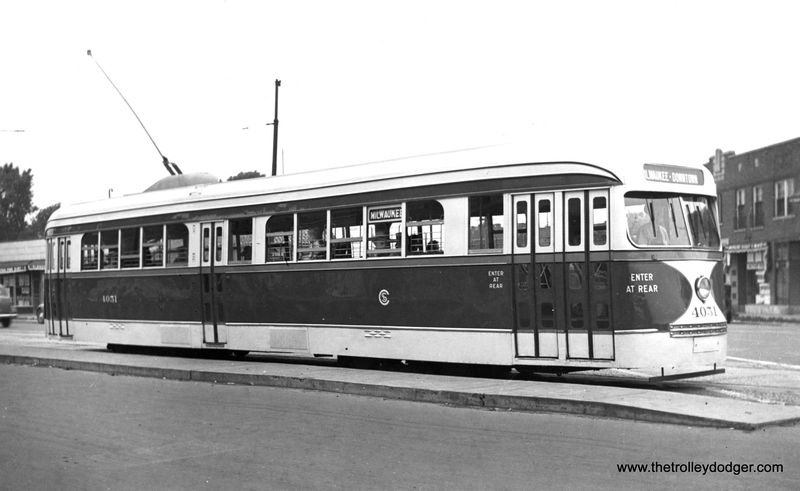 In 1949 it was sold to Speedrail, but was not rehabilitated until March 1951. 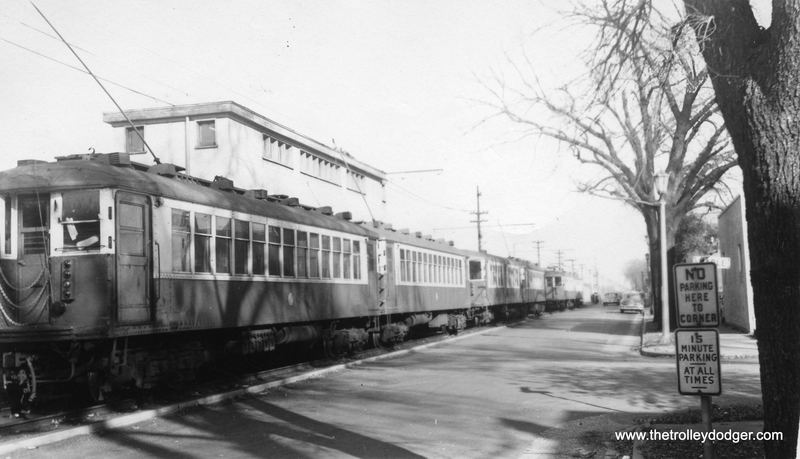 But it only ran for 3 months as 66 before the line was abandoned and then scrapped in 1952.” Here, LVT 1102 is shown on a flatcar at Riverside in late 1949 for its trip to Speedrail. 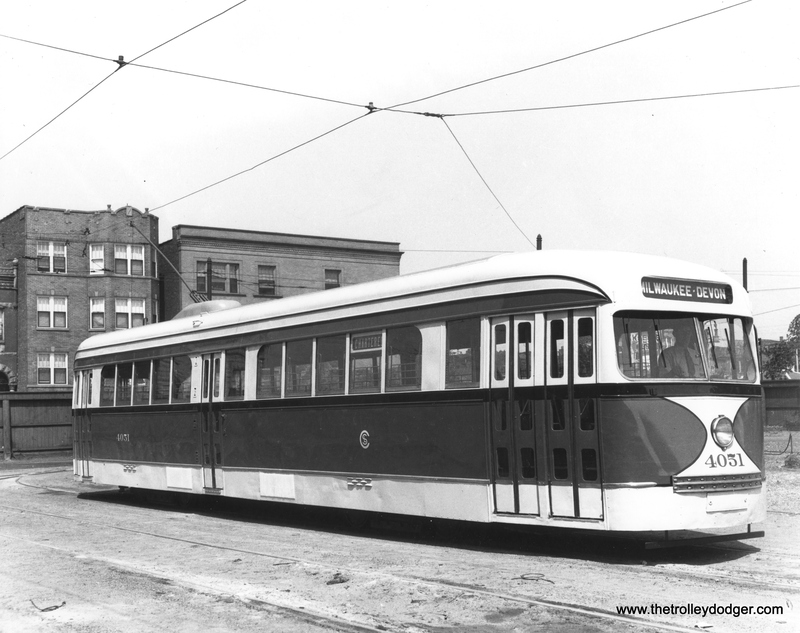 This was a Cincinnati curved-side car, and had been used on LVT’s “other” interurban, the Easton Limited, where these cars proved to be underpowered for the hilly terrain and had difficulty maintaining schedules kept by the cars they replaced. 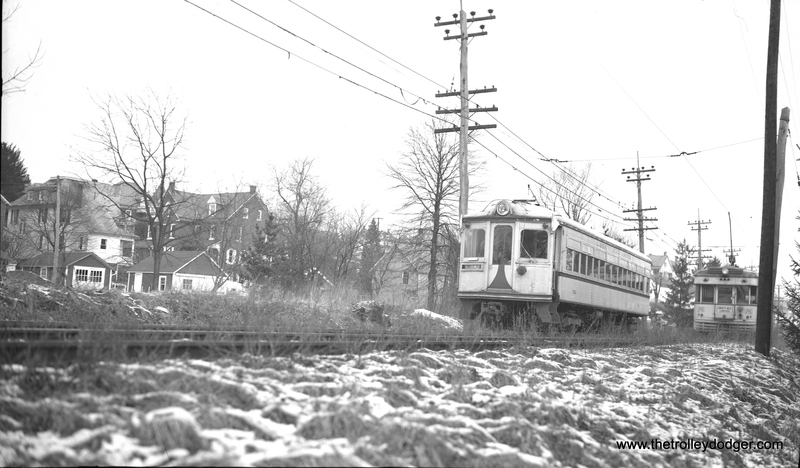 LVT 702 is “at speed” southbound at West Point in this wintry February 11, 1951 view. 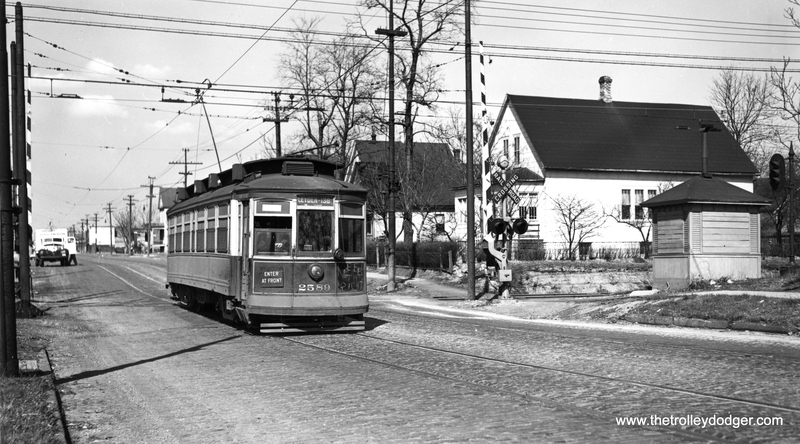 Either this April 1, 1951 picture of LVT 1020 was taken with a fisheye lens, or it demonstrates the kind of hilly terrain that LVT had to navigate through, unlike the Midwest interurbans. 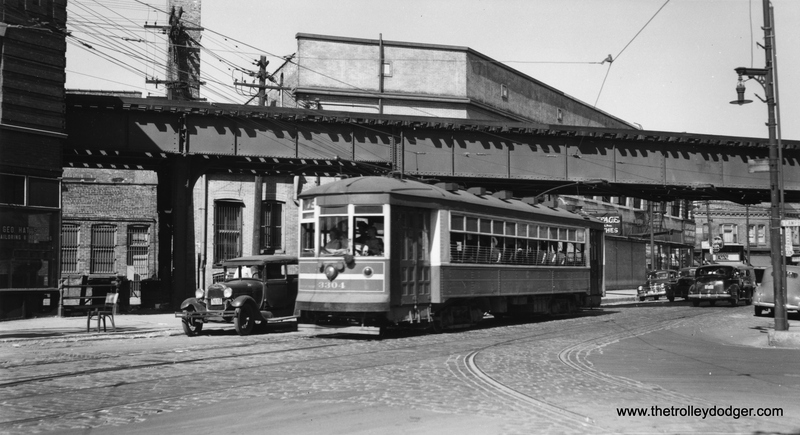 This broadside was taken at Jordan and Washington streets. 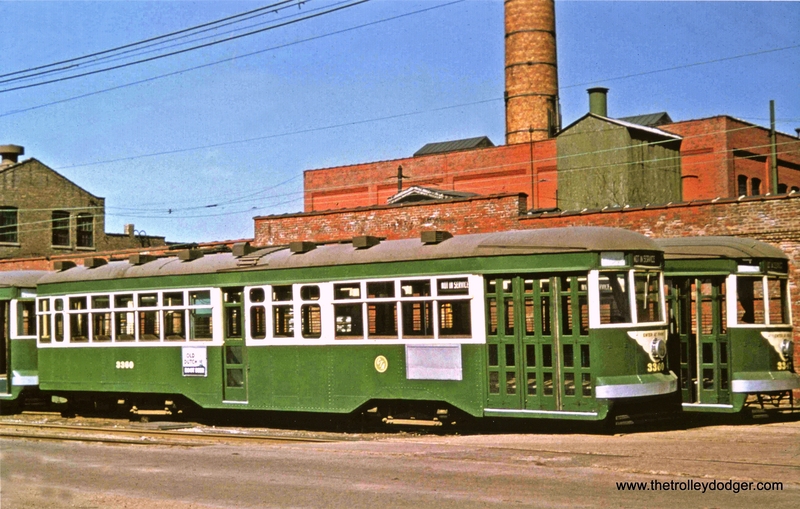 It’s April 21, 1952, seven months after abandonment of the Liberty Bell interurban, and work cars #1 and 548 are in the scrap line at Bethlehem Steel on Daly Avenue. 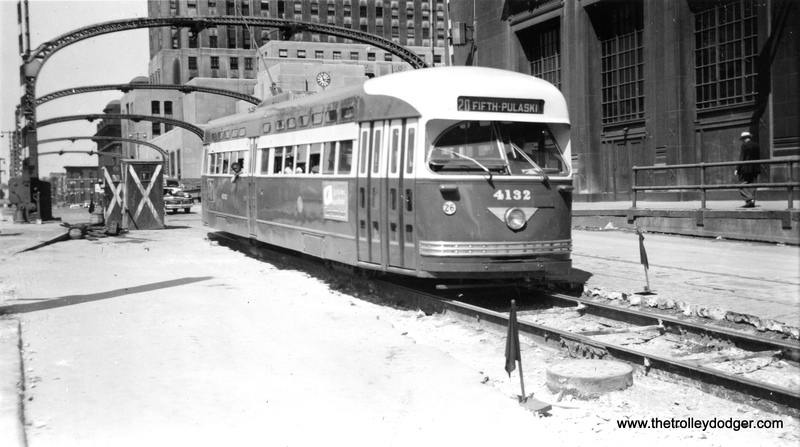 By this point, anything not needed for the city streetcars, which continued to run for another year, was being gotten rid of. 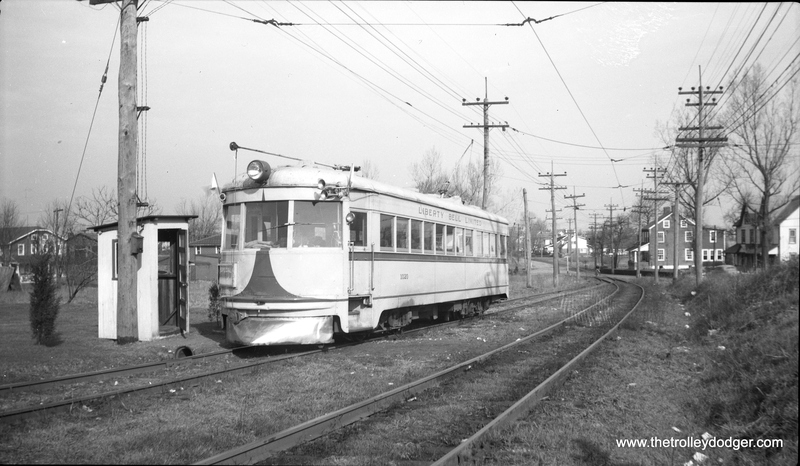 LVT 702 passes one of the ex-C&LE lightweights in the 1000-series at Seller’s Siding on February 11, 1951. 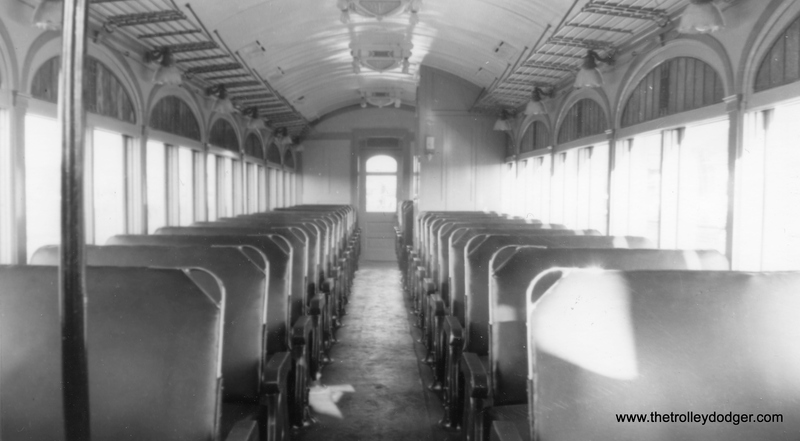 An interior view of newly renovated LVT 812, as it looked on November 11, 1939. 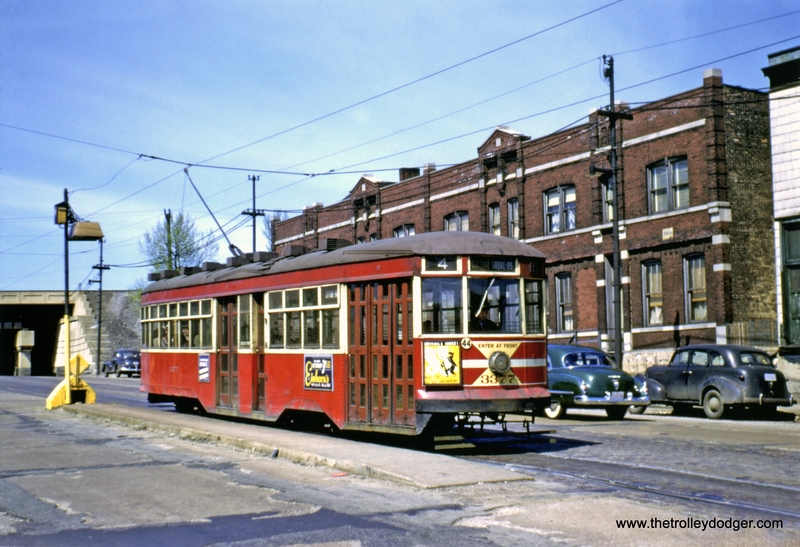 It is a shame that this car was not saved. 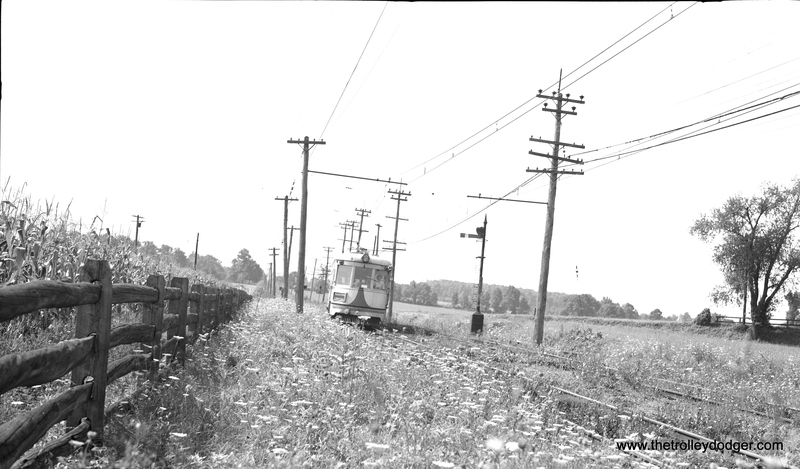 Most of the Liberty Bell route was single track with numerous passing sidings, such as this one, where 1020, on a fantrip, has to telephone in to the dispatcher and wait for instructions before proceeding. 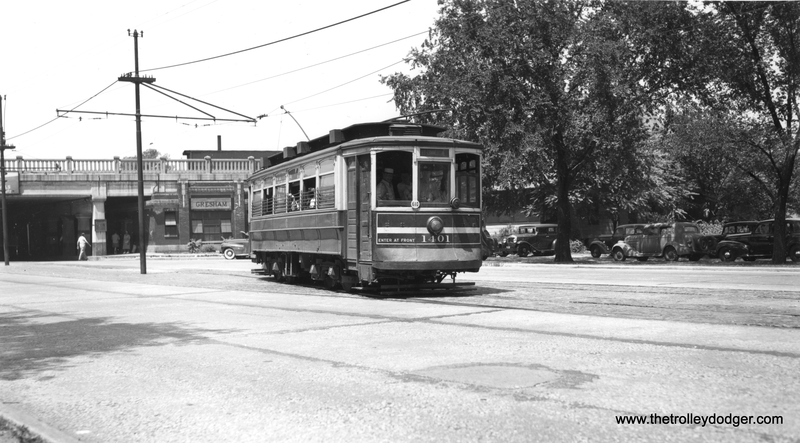 This type of operation, once so common among early interurbans, resulted in some terrible collisions over the years. 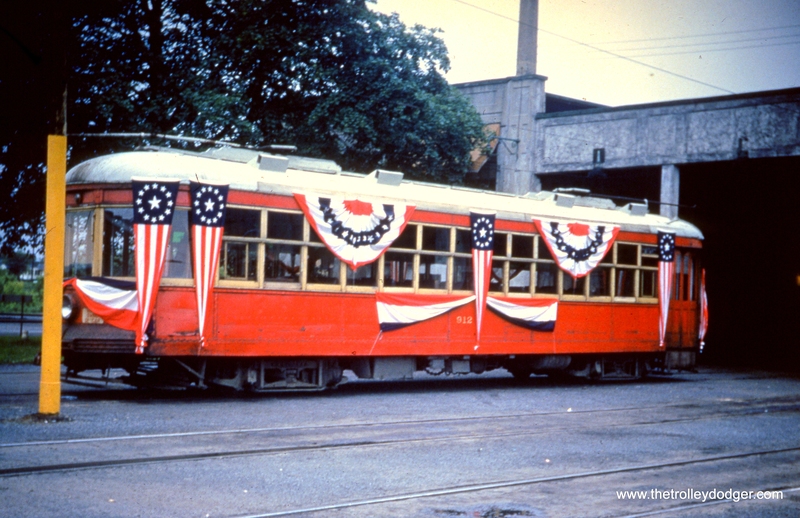 LVT 912, dressed in bunting at Fairview car barn for the last run of an Allentown streetcar, on June 7 1953. 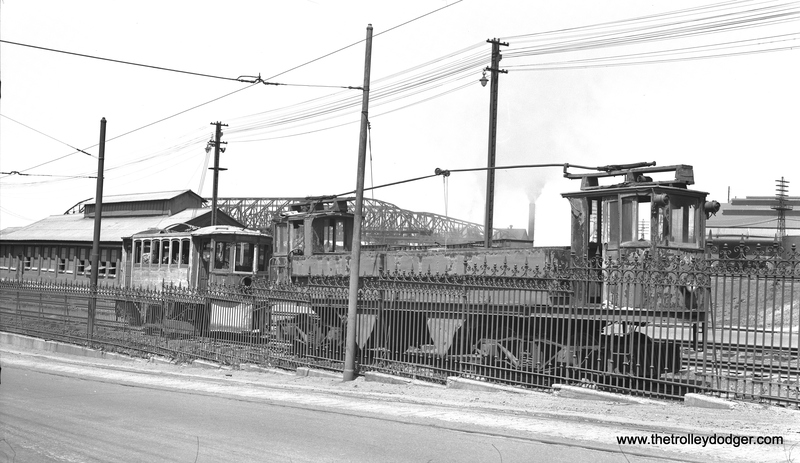 LVT express freight motor C-16 near 69th Street terminal in January 1951. 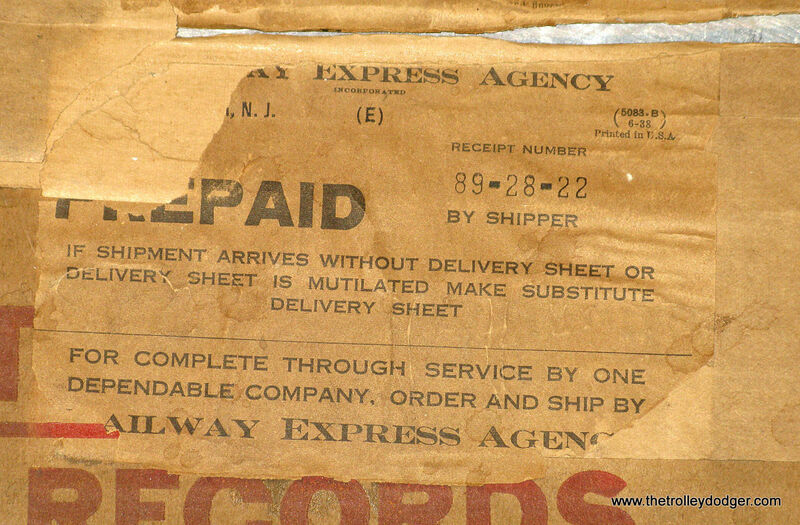 Even though LVT stopped running passenger service over the Red Arrow in 1949, freight service continued over the line as it helped pay the bills. 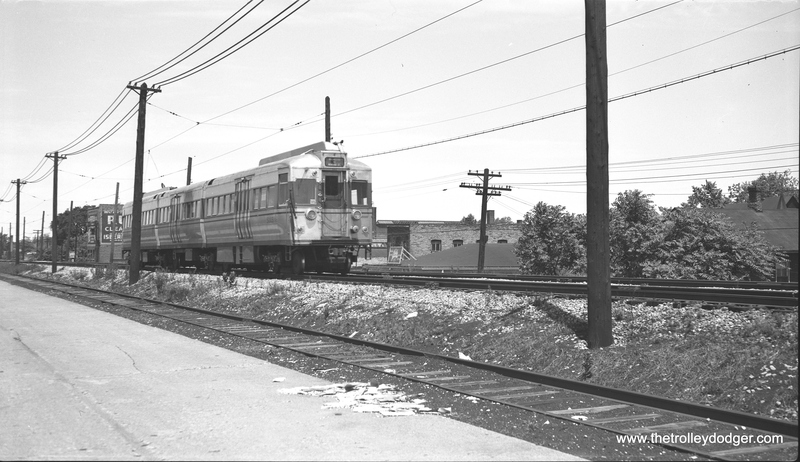 LVT freight motor C-17 approaches Norristown terminal on the Philadelphia and Western in January 1951. 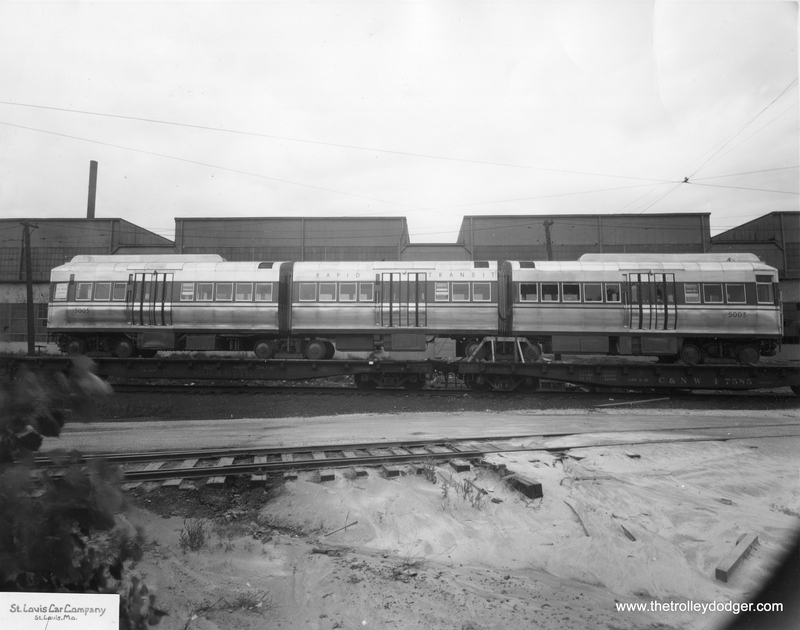 Although the Liberty Bell Limited cars stopped running on the P&W in 1949, freight operations continued right up to the time of the September 1951 abandonment. 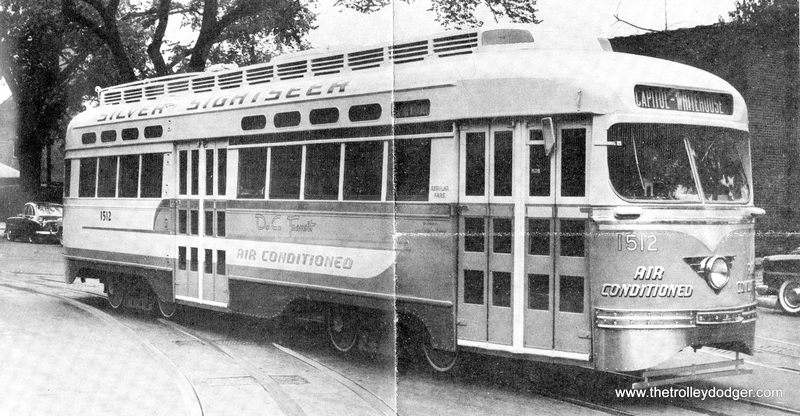 Before Marvel Comics had a “silver Surfer,” DC Transit had their own superhero, the “Silver Sightseer,” the first air-conditioned streetcar. 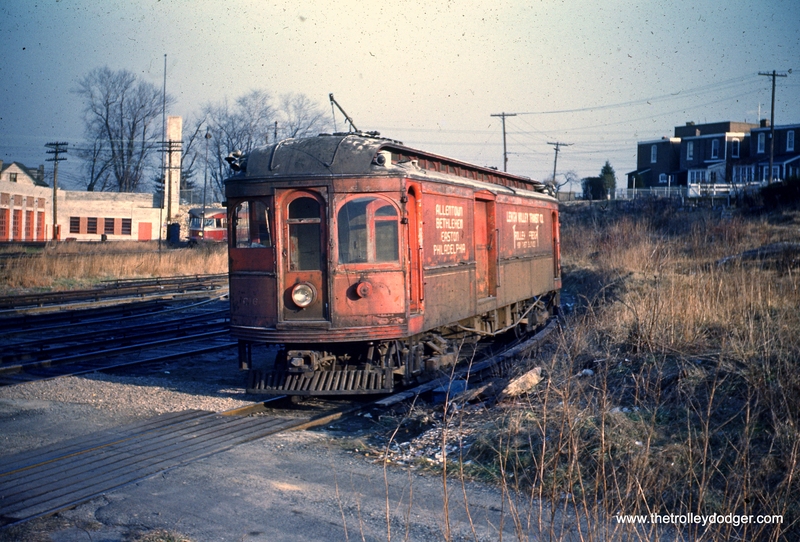 While 1512 managed to survive the 1962 shutdown, it was later damaged in a fire at the National Capital Trolley Museum and scrapped. 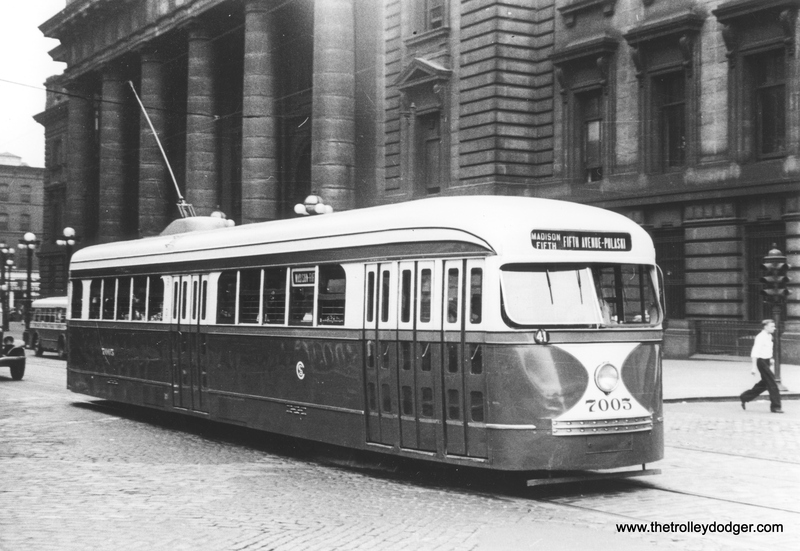 The Silver Sightseer began running in 1957. Washington, D. C. can get very hot in the summer, and I am sure this car was a welcome relief. 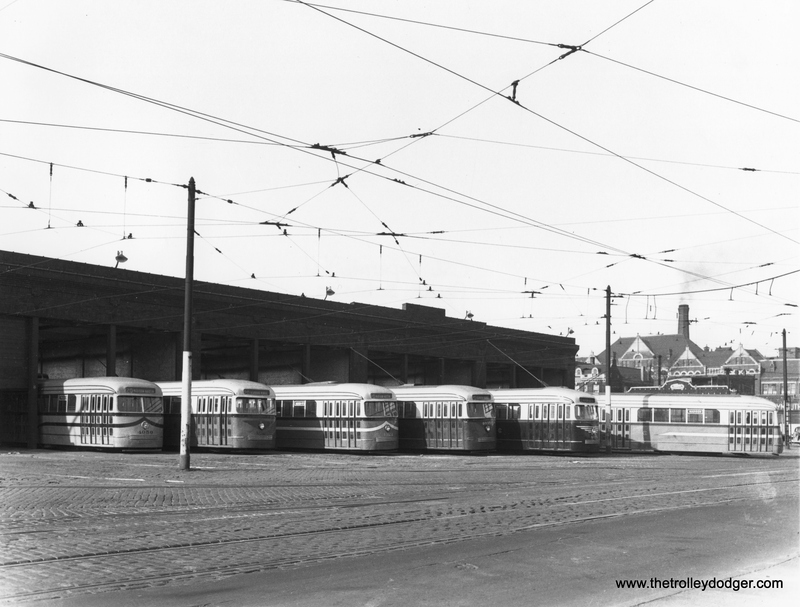 CO&P city car 112 at the La Salle car barns. 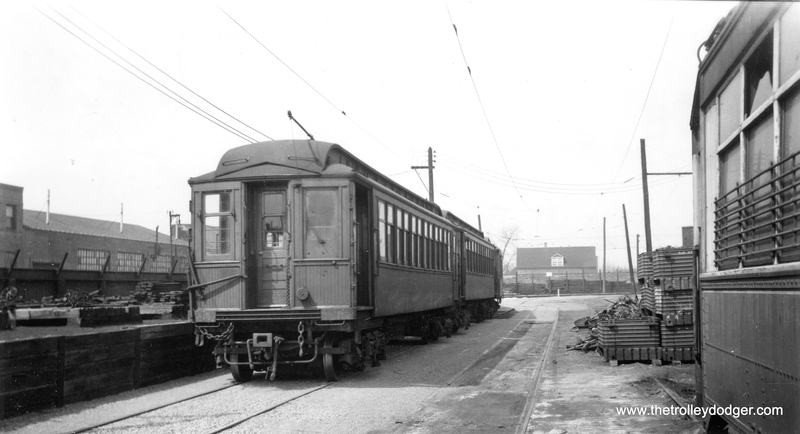 CO&P freight motor 1523 at the Ottawa shops in 1934. 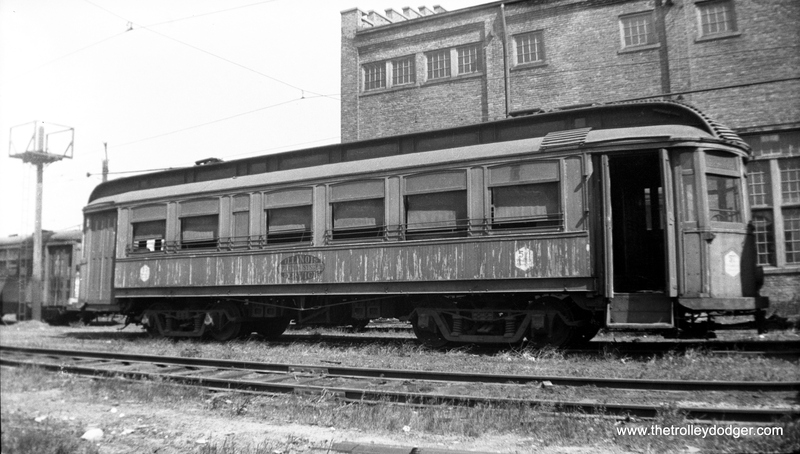 This was a so-called “pull car” that was used as a locomotive. 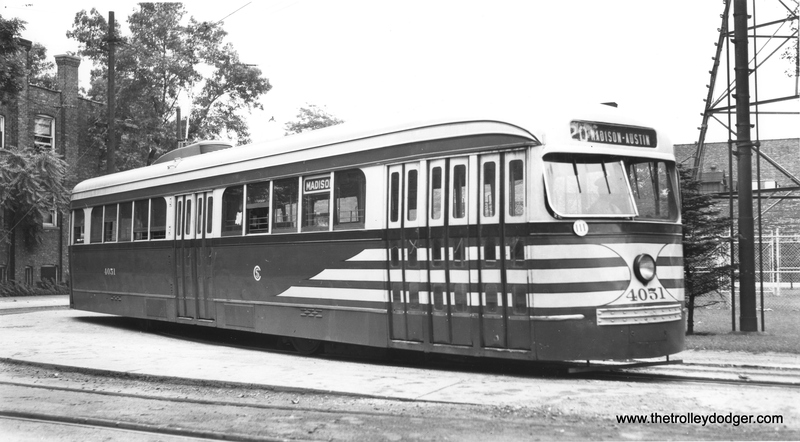 CO&P car 57, the “Western Special,” at the Ottawa Shops in 1934. 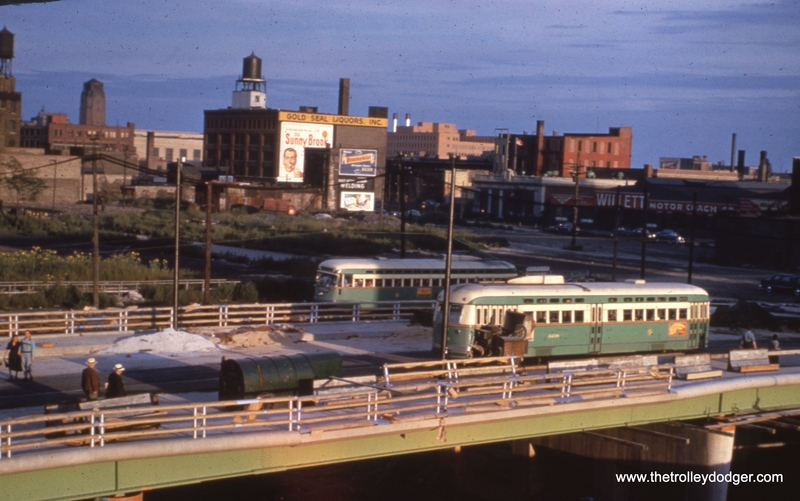 This is our 127th post, and we are gradually creating a body of work and an online resource for the benefit of all railfans, everywhere. 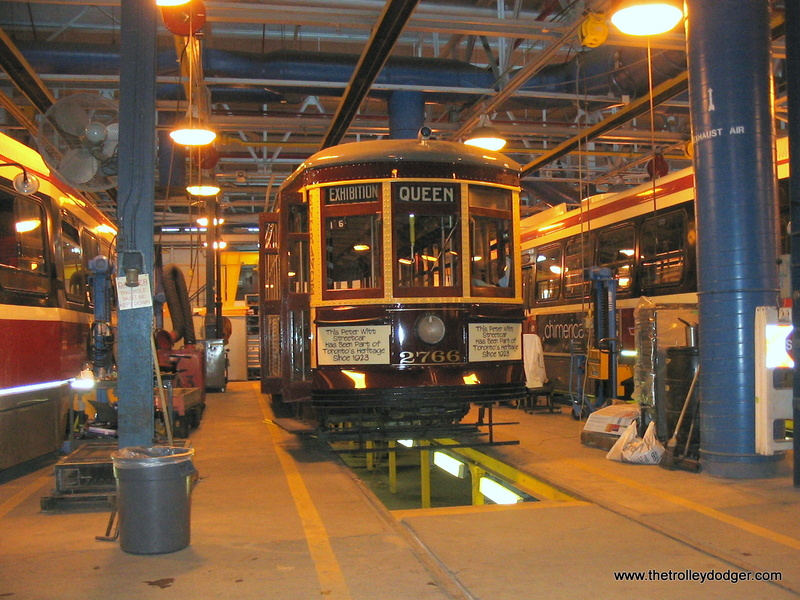 To date, we have received over 136,000 page views, for which we are very grateful. 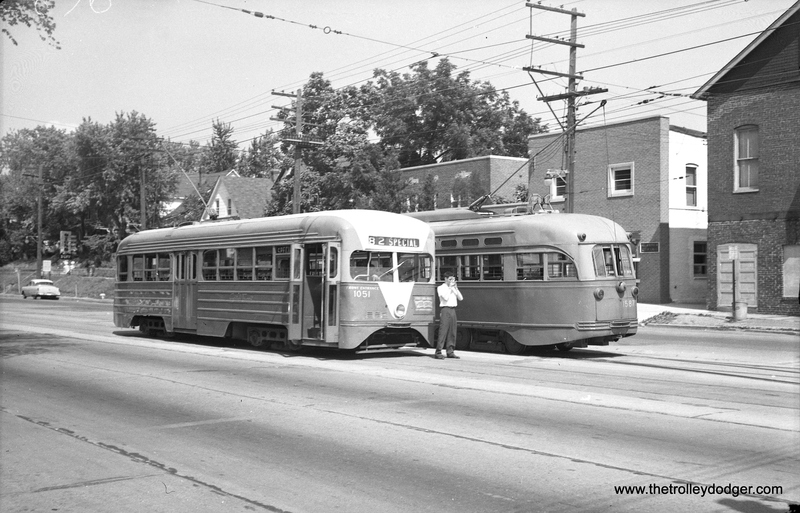 CTA 192 at 63rd Place and Major (5700 W.) in June 1952, after the prewar PCCs had been removed from the 63rd Street route. 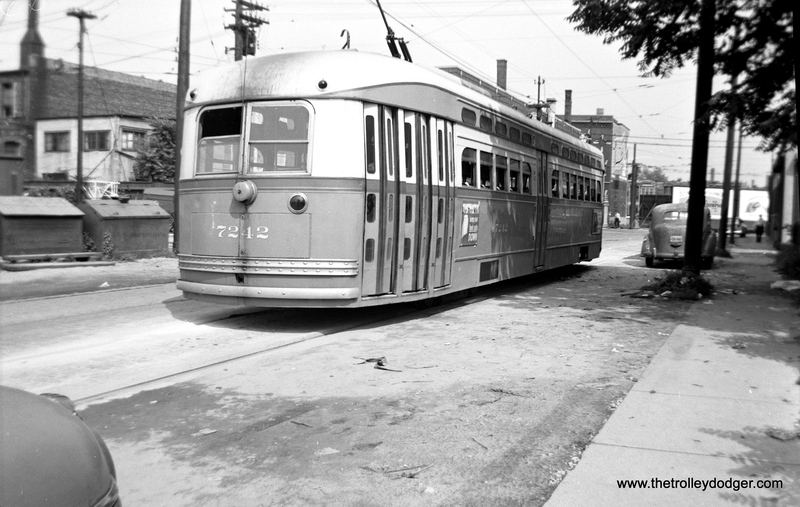 Some postwar PCCs would also be used on this line before streetcars were abandoned in 1953. 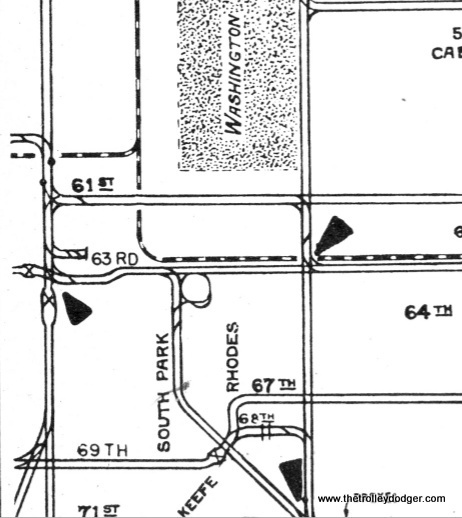 Major was the end of the private right-of-way on the west end of this route. 63rd Place and Major today. 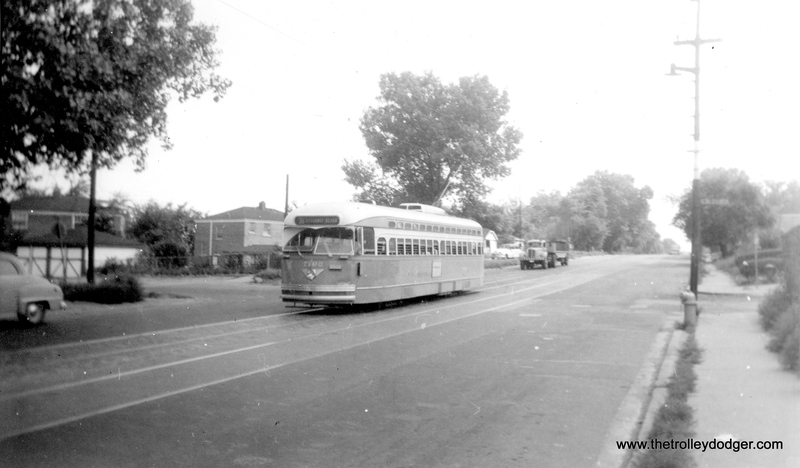 After streetcars were abandoned, bus service on this portion of the line was relocated to 63rd Street. 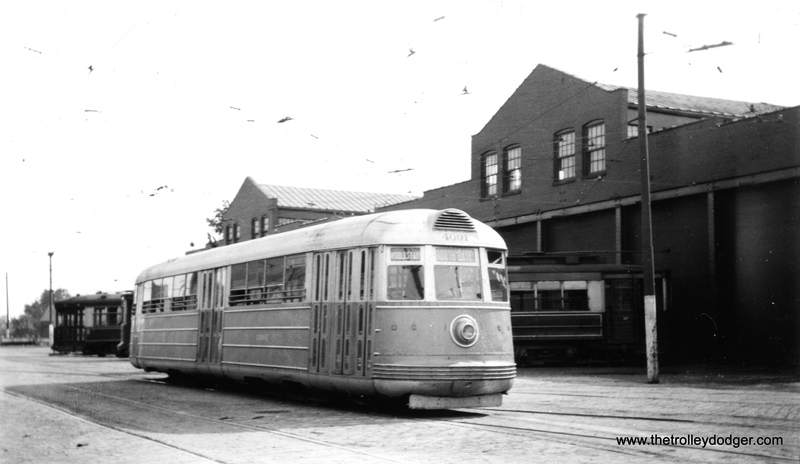 The same terminal at Narragansett and 63rd Place remained in use, however. We are looking west. 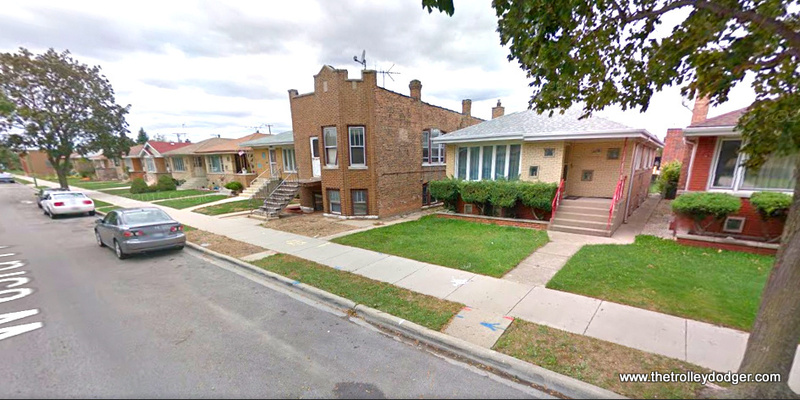 The older house in the middle of the picture (5714 W. 63rd Place) also appears in the 1952 image. 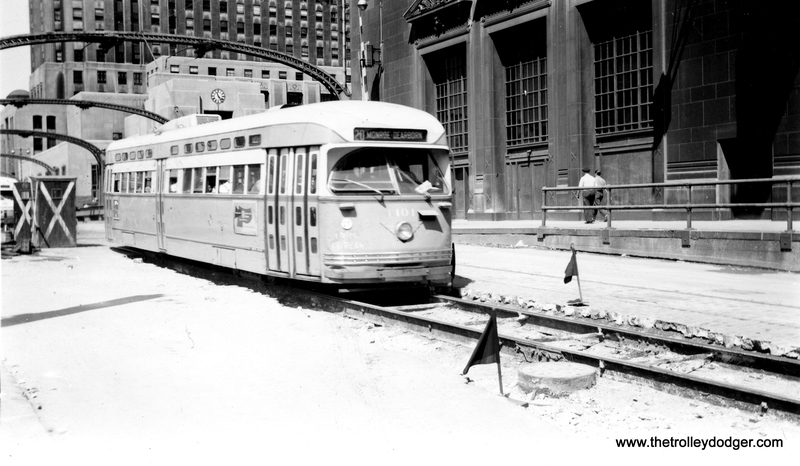 Here is another generous helping of classic Chicago streetcar photos from the latter part of the Chicago Surface Lines era as well as the early days of its successor, the Chicago Transit Authority. We even have one picture from before CSL days. 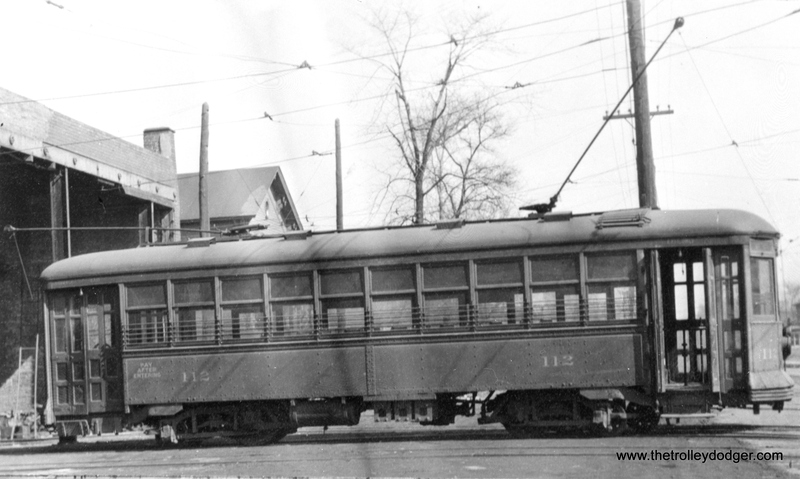 This is our 126th post, and we are gradually creating a body of work and an online resource for the benefit of all railfans, everywhere. 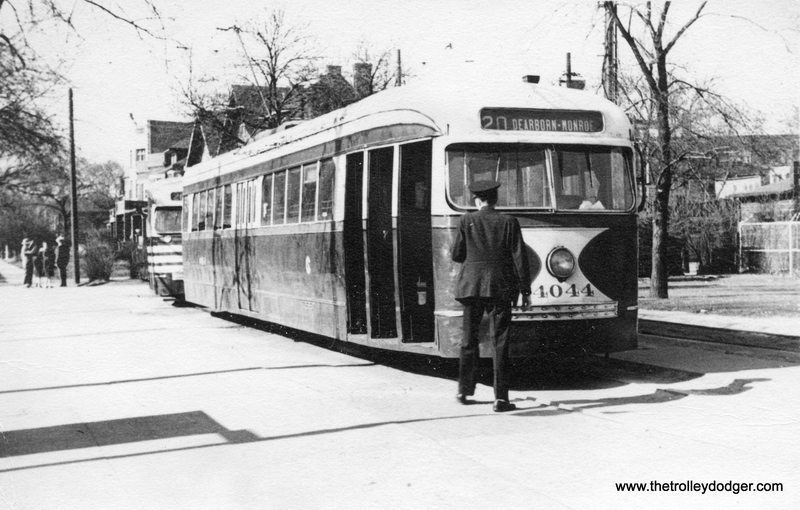 To date, we have received over 134,000 page views, for which we are very grateful. Harrison and Central today. 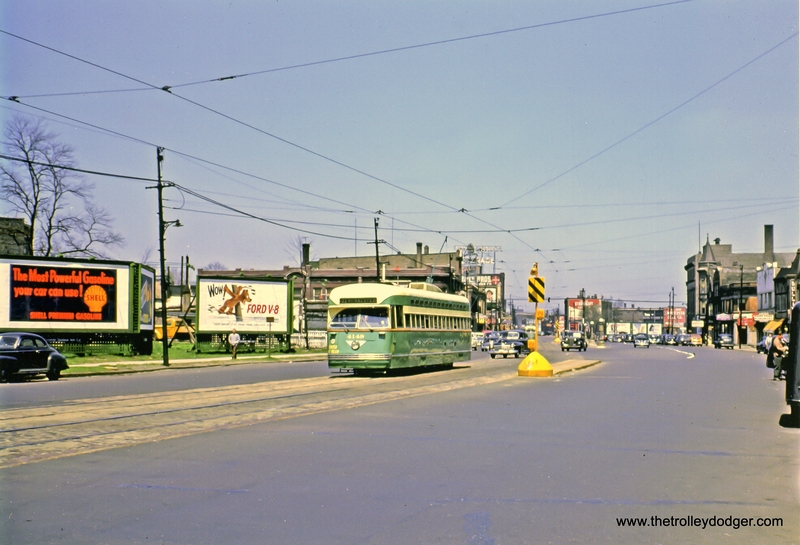 Now there is a turnaround loop for CTA buses just west of Central. 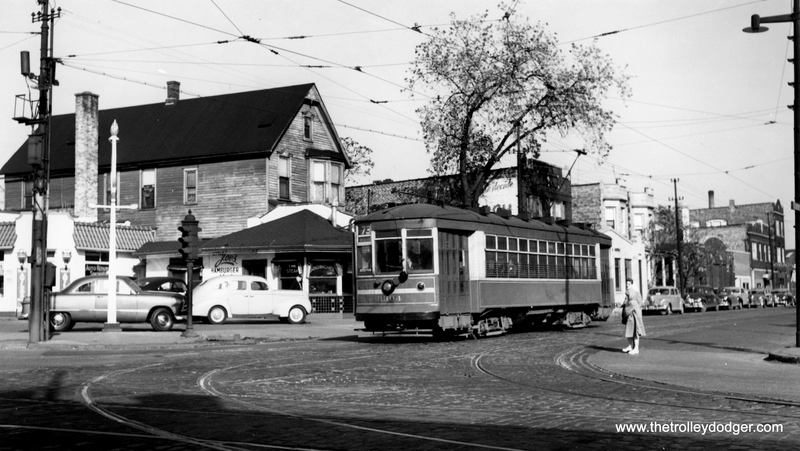 Vincennes and 75th today. We are looking northeast. Armitage and Cicero today. We are facing east. 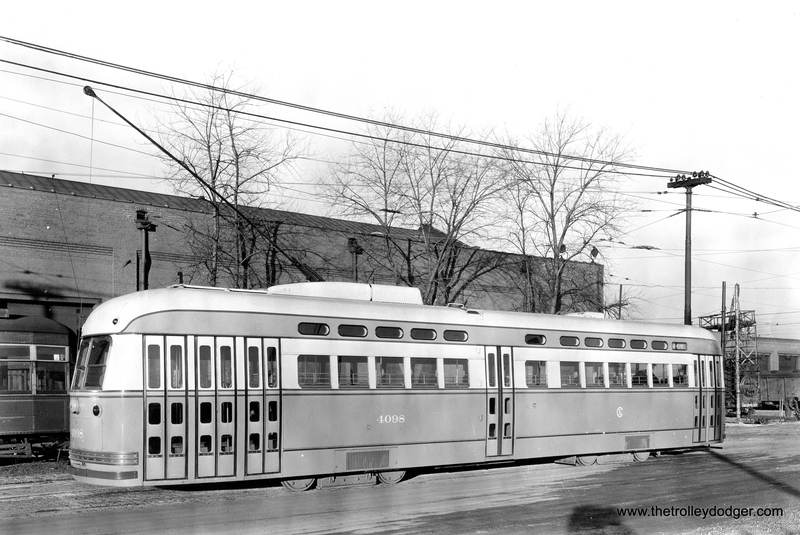 CSL 5998 on the Archer line. 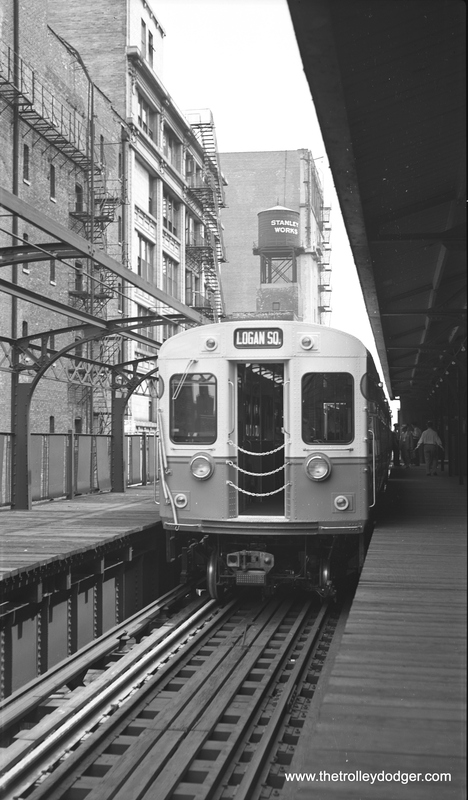 CSL 3304 is westbound at Armitage and Campbell on route 73, having just passed under the Logan Square branch on the “L”. 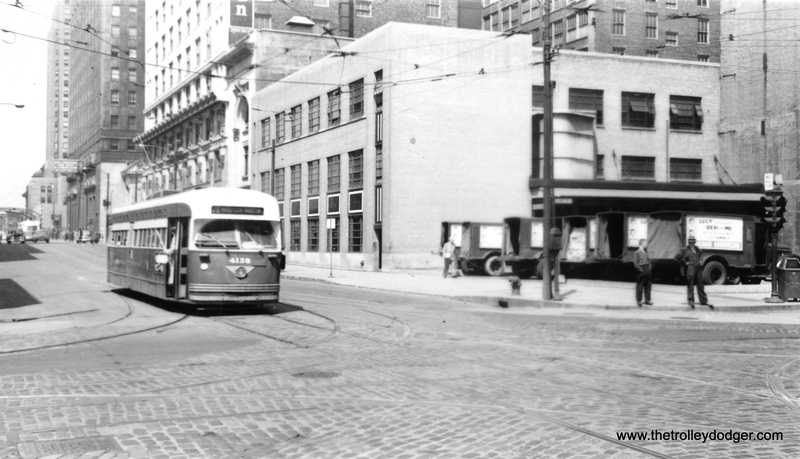 That looks like a Model A Ford at left. 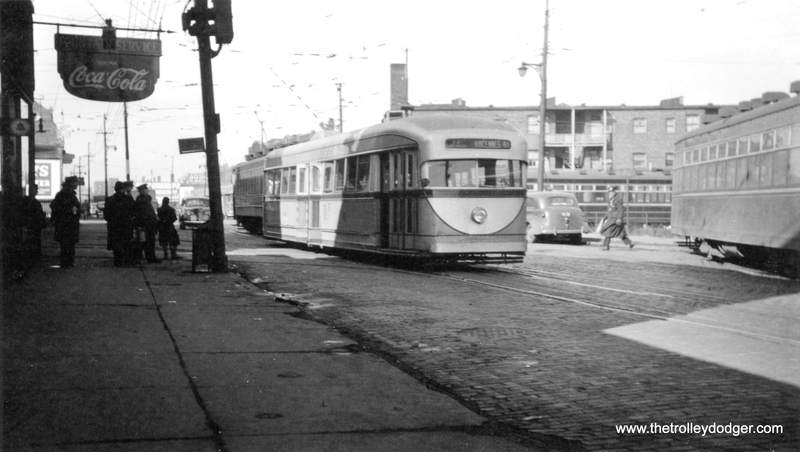 Belmont and Sheffield today. We are looking northwest. Wabash just south of Harrison today. 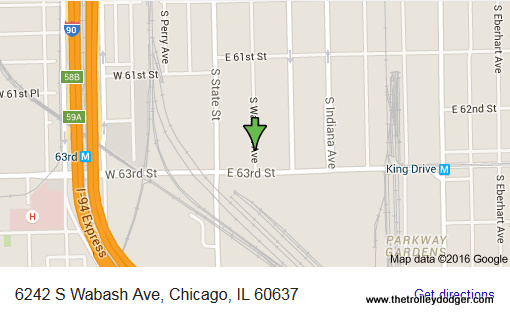 The “L” has been relocated just north of here to soften out a curve. 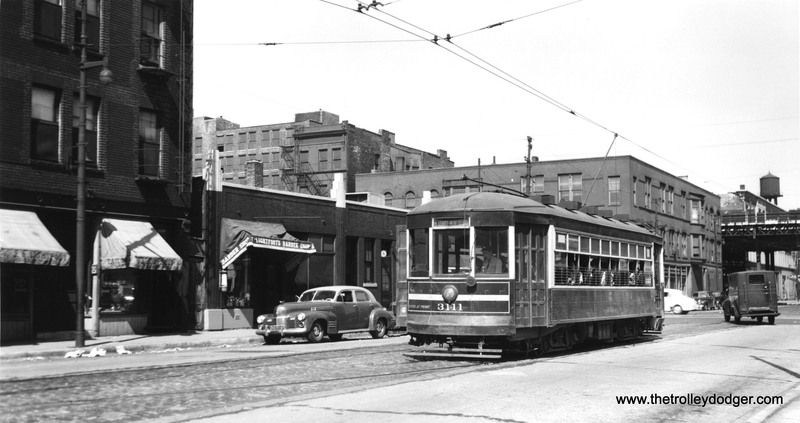 18th and Sangamon today. We are looking northeast. 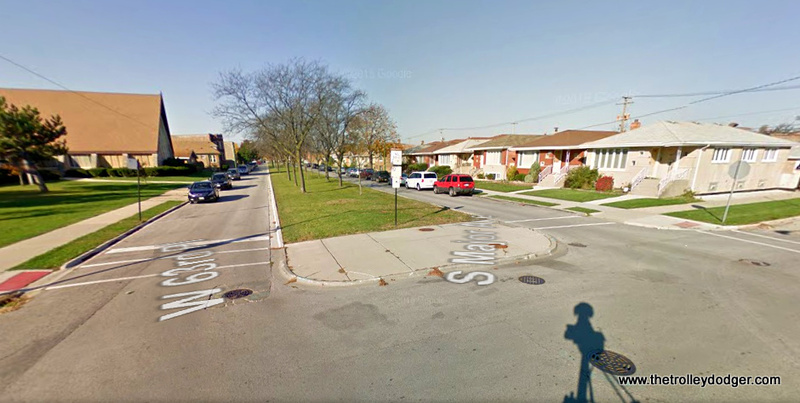 75th and South Chicago today.